Here is another vacation that does not include our 5th wheel. Since we didn't have any local commitments for Christmas and New Year's Day, we decided to leave Houston for a vacation in a place that was warmer than Houston in December. 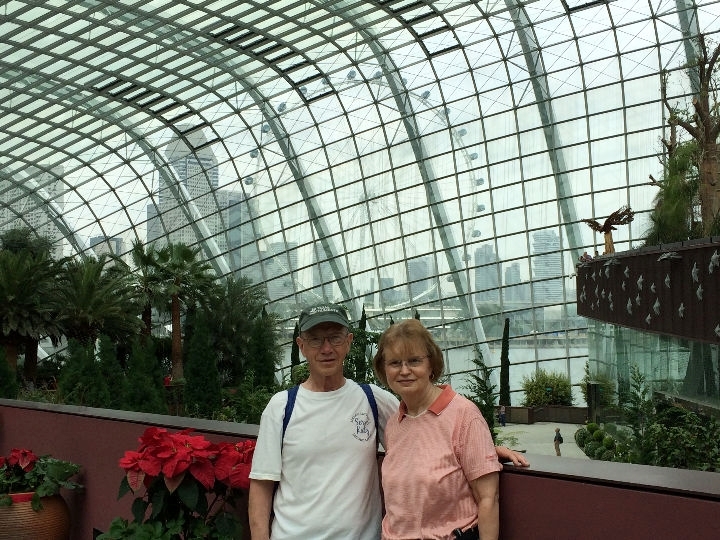 Working for Texas Instruments, Lawson had made many business trips to Singapore, but Kay had never been. 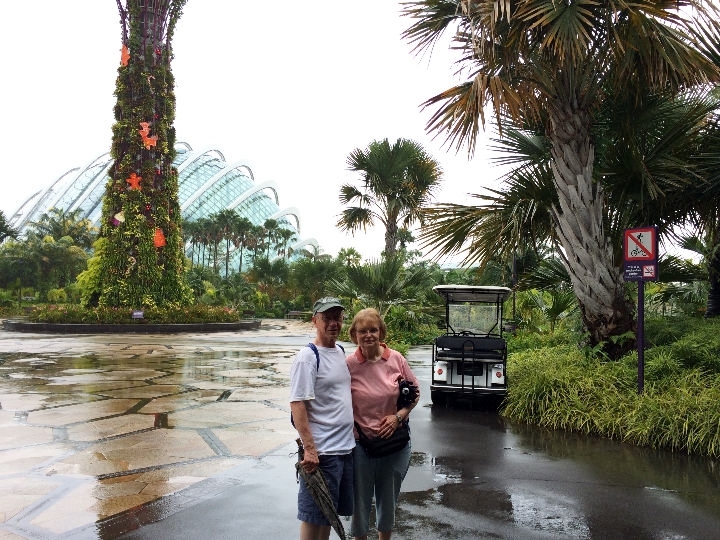 Lawson always wanted Kay to experience Singapore, an island country that is a tropical paradise. 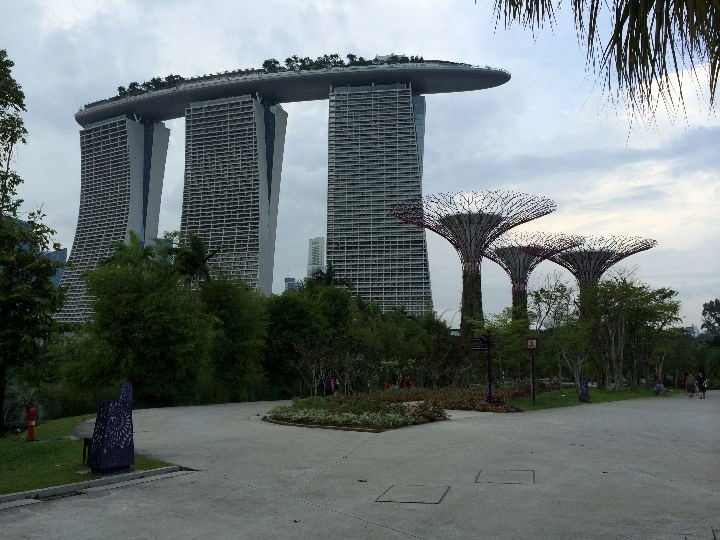 Learning that Singapore Airlines had a direct flight from Houston, we made our plans. We stayed in the Shargri-La Hotel, which is one of the first international hotels in the country and the one Lawson stayed in on his first trips there. 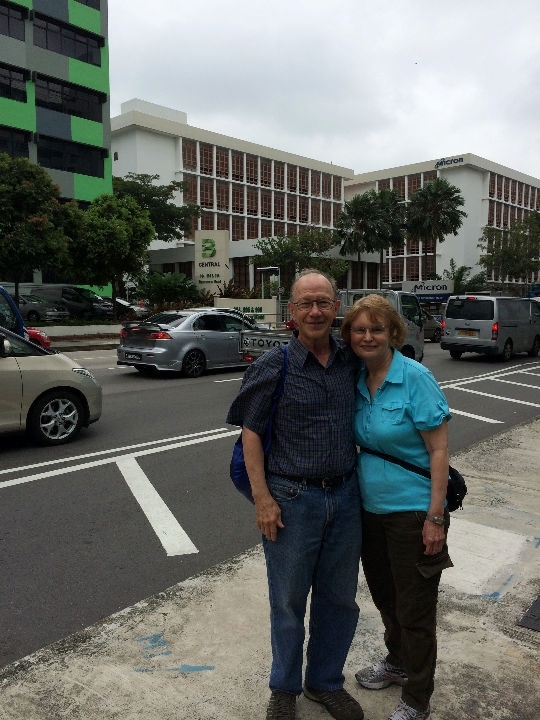 In addition to all the cultural experience of Singapore people and food, as a extra special bonus, we visited with many of Lawson's ex-TI friends that live in Singapore. We were made to feel like royal guests and were shown hospitality that can not be outdone by any other part of the world. 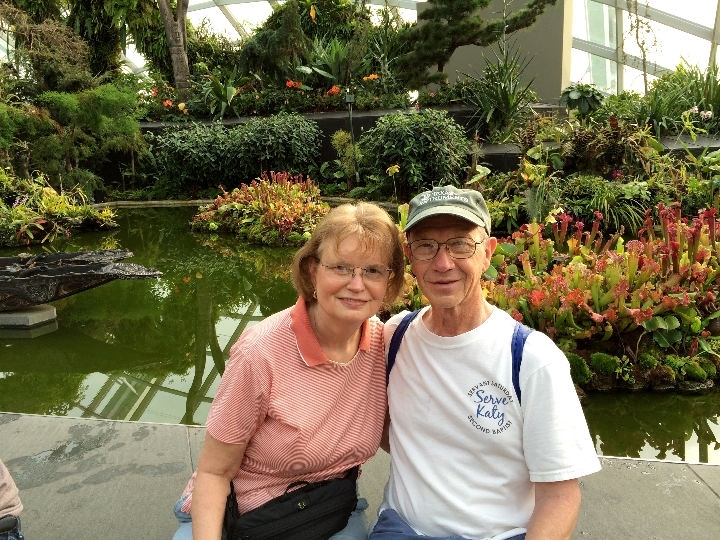 We thoroughly enjoyed our short visit and will have fond memories to last a lifetime. 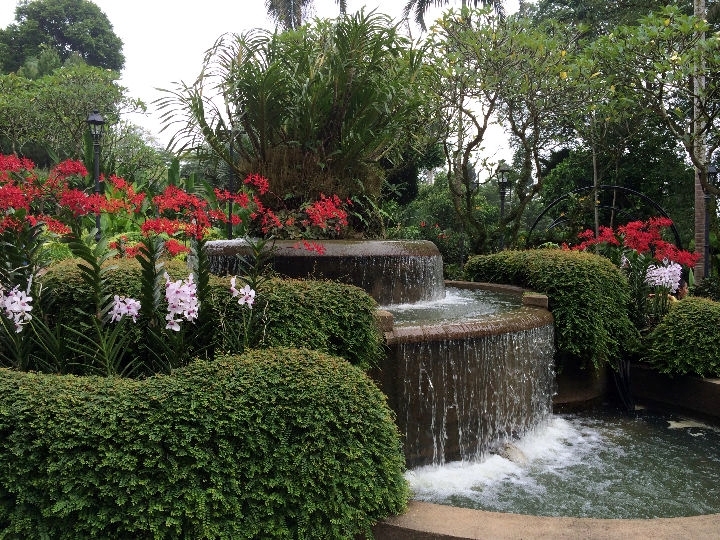 We hope you can experience a glimpse of our pleasure from our story and photos. 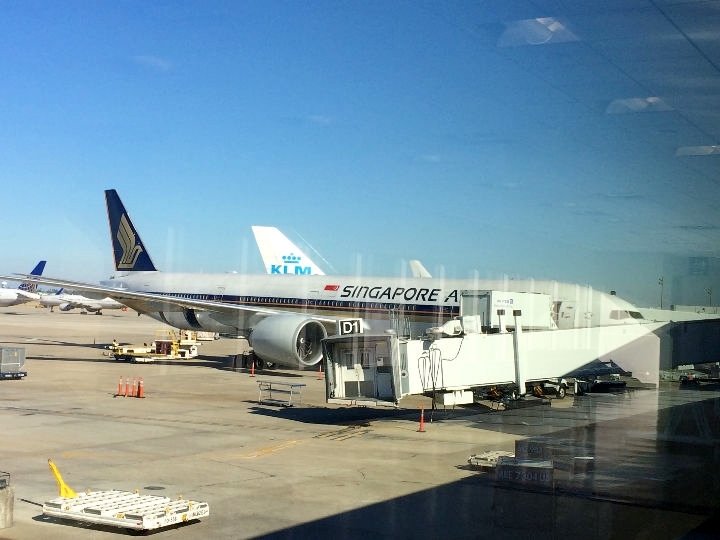 [Tuesday] December 24th, 2013, Christmas Eve - Our Singapore Airlines flight SQ61 was scheduled to depart from Houston Intercontinental Airport Terminal D, gate D3 at 4:40 PM. Since we were unfamiliar with international travel since 9/11, we decided to leave home with lots of time to spare and eat lunch at the airport. We left home at 11 AM and after parking at the PreFlight offsite lot and riding the shuttle to terminal D, we had to wait about 30 minutes before the Singapore Airlines baggage check counters opened. After getting our bag checked, we went through the Homeland Security checkpoint with minimum hassle and proceeded to the departure lounge area and as luck would have it, a Subway sandwich shop (Kay's favorite!) was located in the area. After lunch, and a short wait in the departure lounge, they started boarding the airplane about 3:40 PM. As we entered the Boeing 777-300ER, and settled into seats 47A & 47B, we noted that the airplane was decorated for Christmas on the inside. Let it be noted that all the airplane personnel wished us Merry Christmas (not Happy Holidays or Season's Greetings), which was very nice. The flight to our one stop at Domodedovo International Airport in Moscow, Russia, took 11 hours and 20 minutes. They served us two very hearty and delicious meals and provided snacks and juice at frequent intervals. Economy Class on Singapore Airlines is first class in every way except the extra legroom in your seat area. < Our flight ready to take off from IAH. 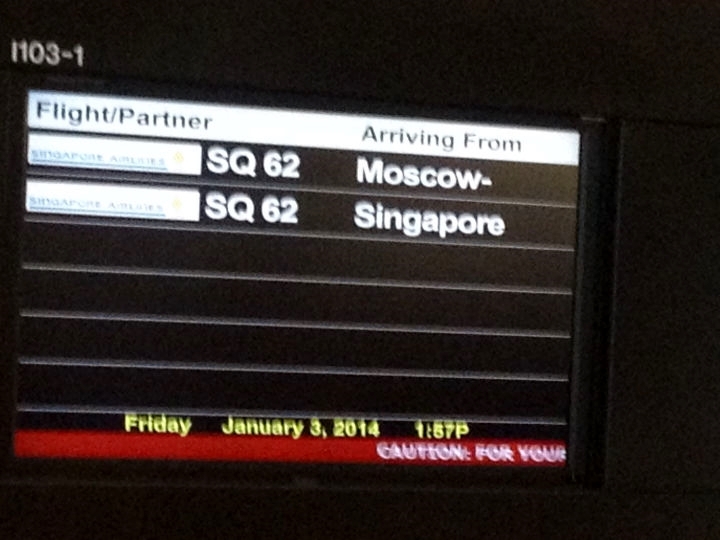 [Wednesday] Christmas Day - We arrived at Moscow's DME airport at about 2:00 PM Moscow time. The temperature outside was said to be in the low 30's F and the ground had a good coating of snow from previous snowfalls. They made everyone get off the airplane with our carry-ons and ran us through a security check before moving us into the Transit Lounge to wait to board the aircraft again. We boarded within a half hour and our airplane departed for Singapore around 3:20 PM Moscow time. 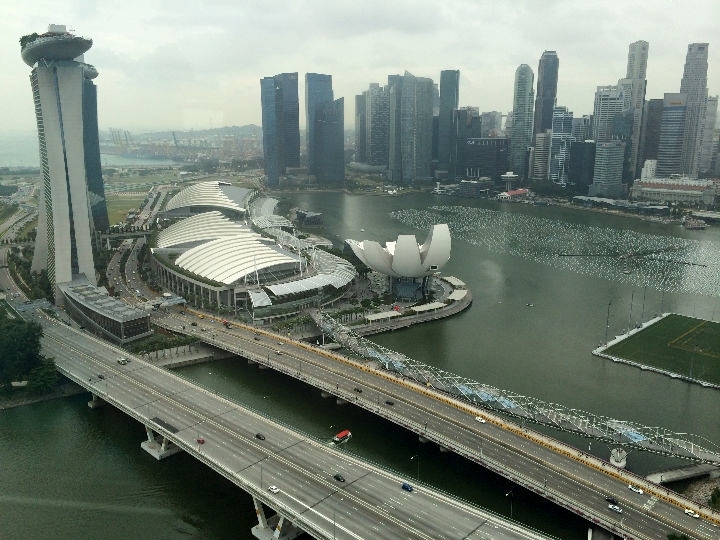 The flight time to Singapore from Moscow is 10 hours and 25 minutes. 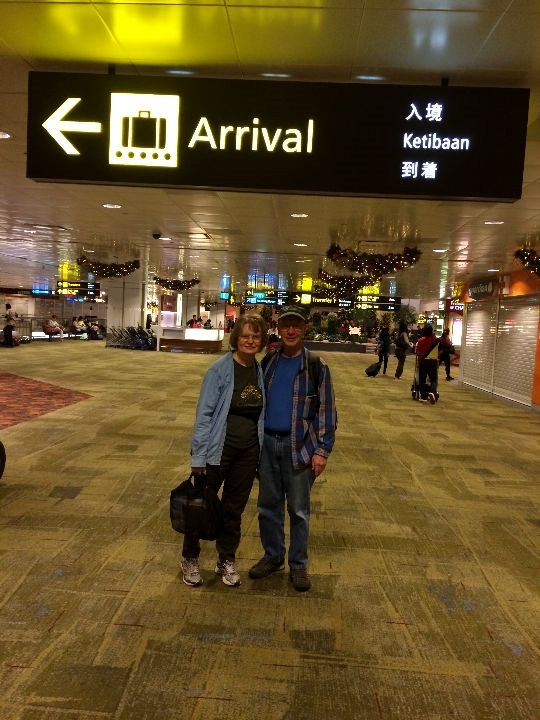 We arrived at Changi Airport in Singapore about 5:15 AM on Thursday, December 26th. 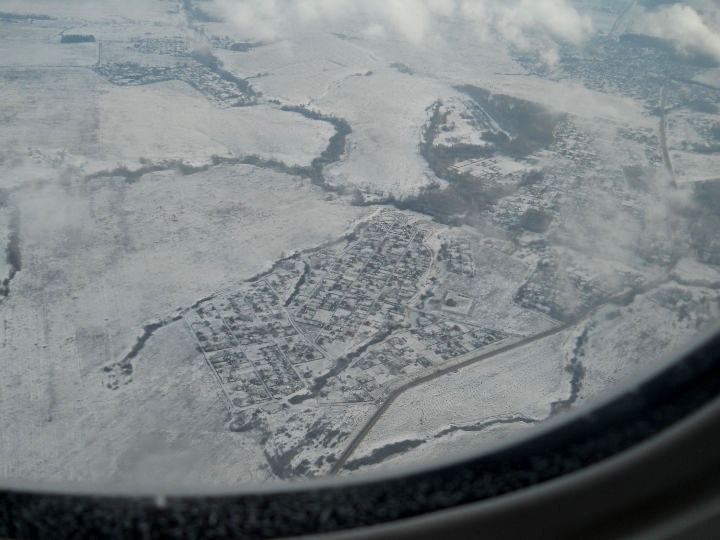 < Landing in Moscow. 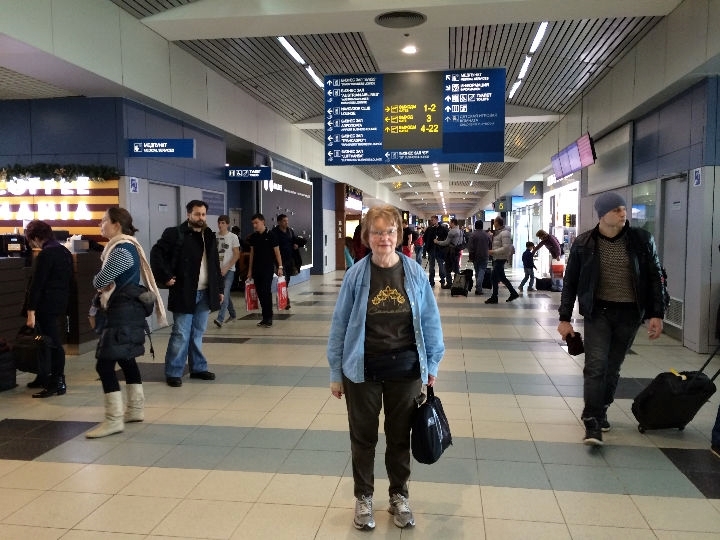 < Kay in Moscow airport. 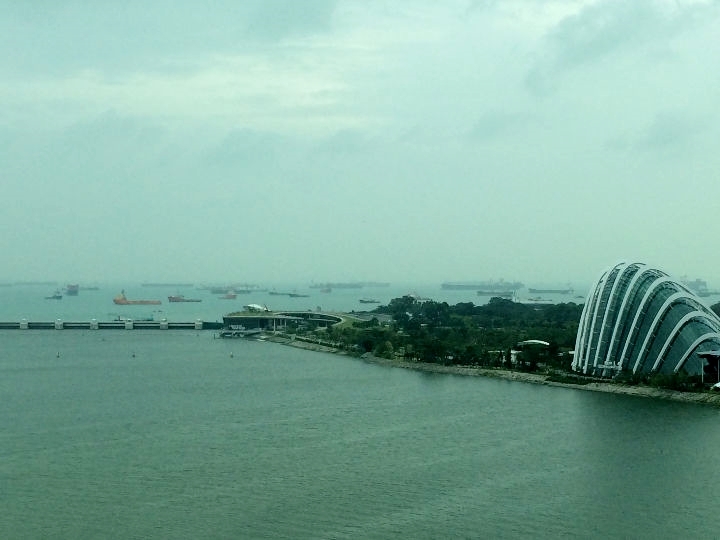 < We arrive in Singapore. 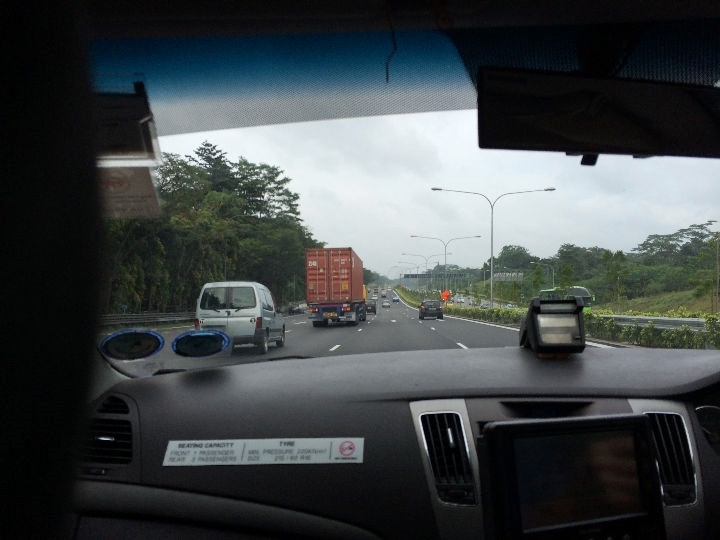 [Thursday] After we departed from the airplane and went through Singapore Customs, we went over to the Customer Service and paid for a shuttle to take us to our hotel. It turns out we were the only passengers and it was cheaper than a taxi, so it worked out good. 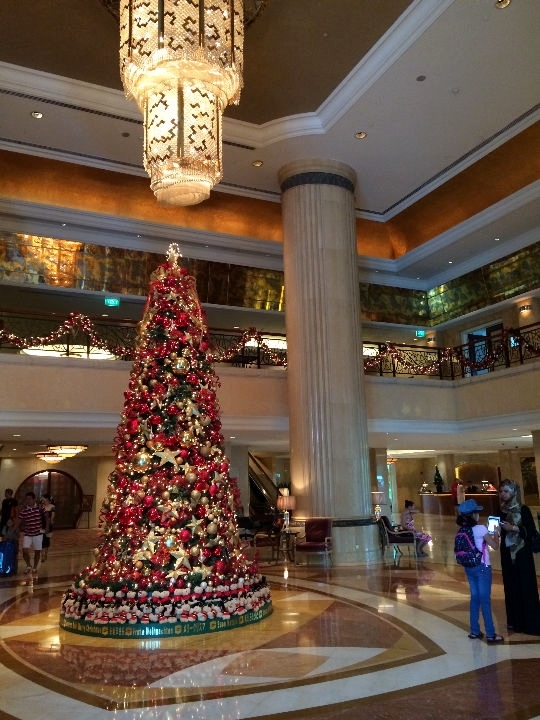 At our hotel, The Shangri-La, they allowed us to check into our room in the Tower Wing very early that morning. 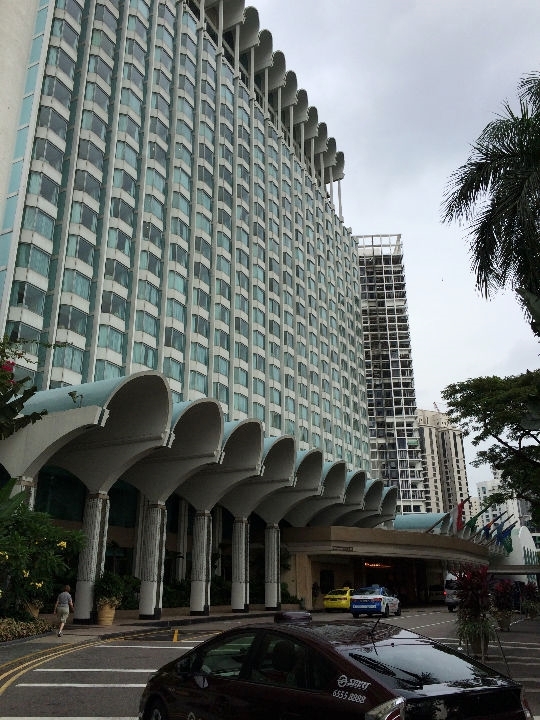 After getting settled into our room on the 8th floor, overlooking the front of the hotel, we were aware that in order to minimize the effects of jet lag, we needed to adapt our schedule to the Singapore schedule as soon as possible. 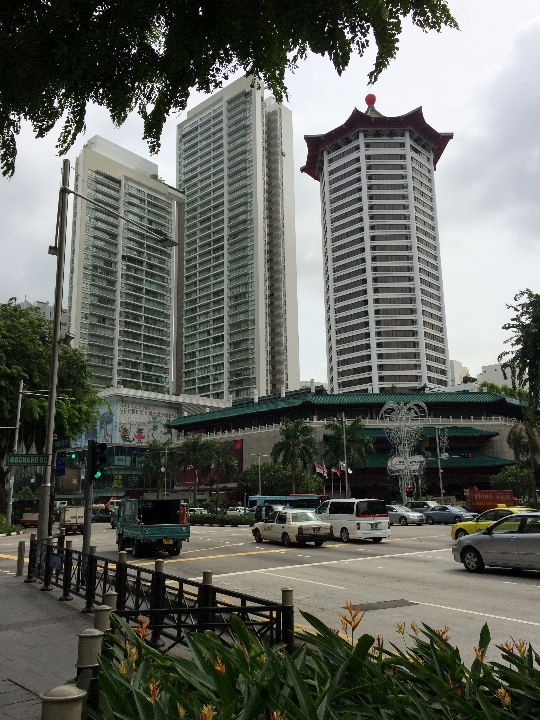 As soon as we unpacked things, we left our room and after a brief look around the hotel, we walked the approximate 1/2 mile to the main shopping district on Orchard Road. 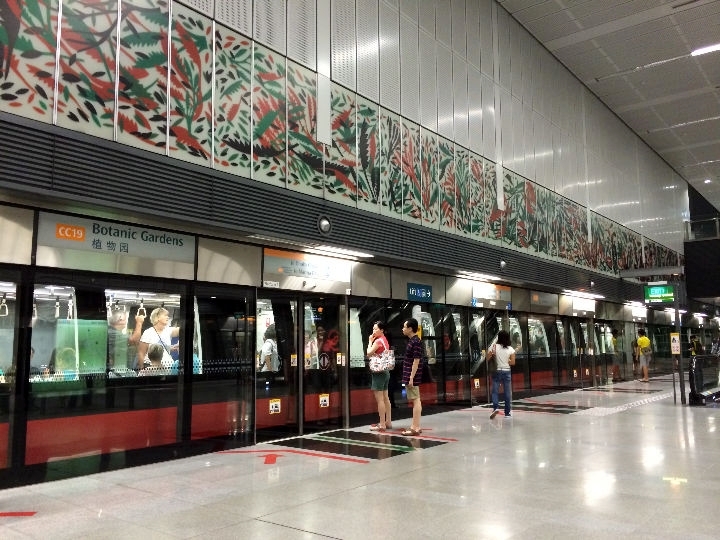 After exploring the area a little, we decided to get introduced to the MRT subway system. 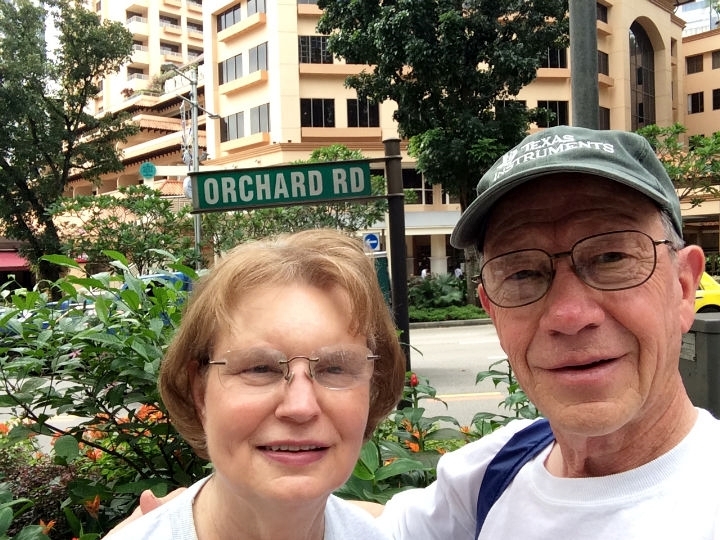 We rode from the Orchard station to the Bishan station on the Red Line. 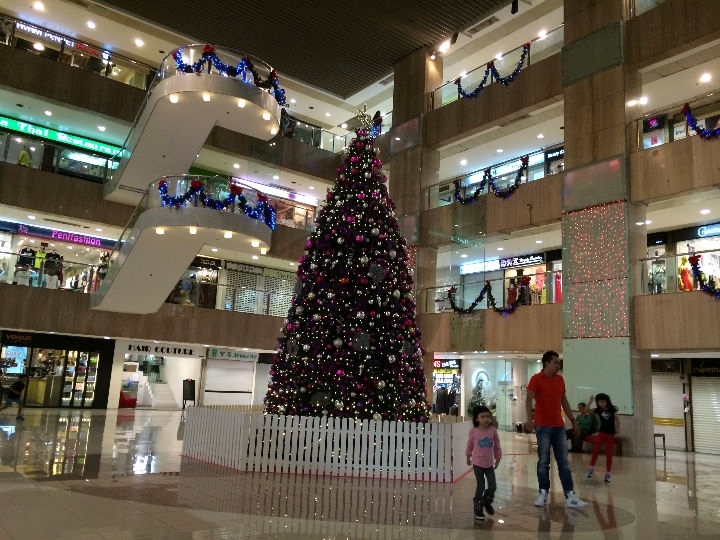 At Bishan, we departed and looked around the shopping center that was nearby. 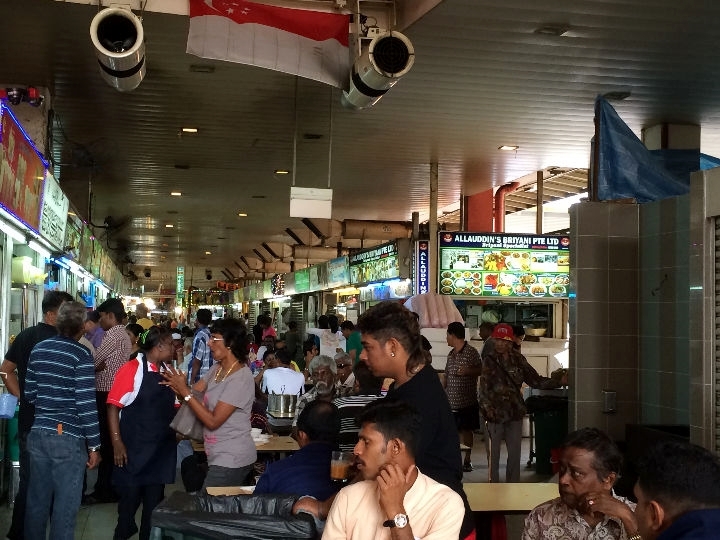 We then boarded the MRT and rode back to the Newton station and went across from the station to the Newton Hawker Center where we had our first true Singapore meal. 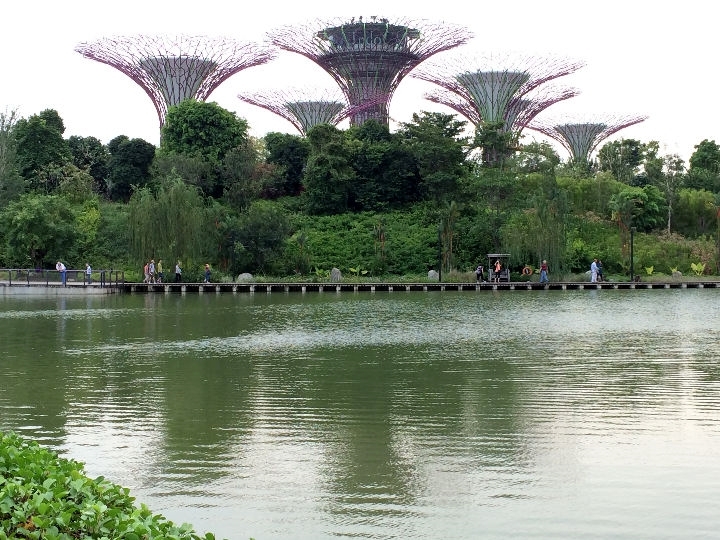 Afterwards, we made our way via MRT back to the Orchard station and walked back to the hotel. By then, it was about 5 PM and we were ready to crash due to insufficient sleep and we went to sleep about 6 PM. 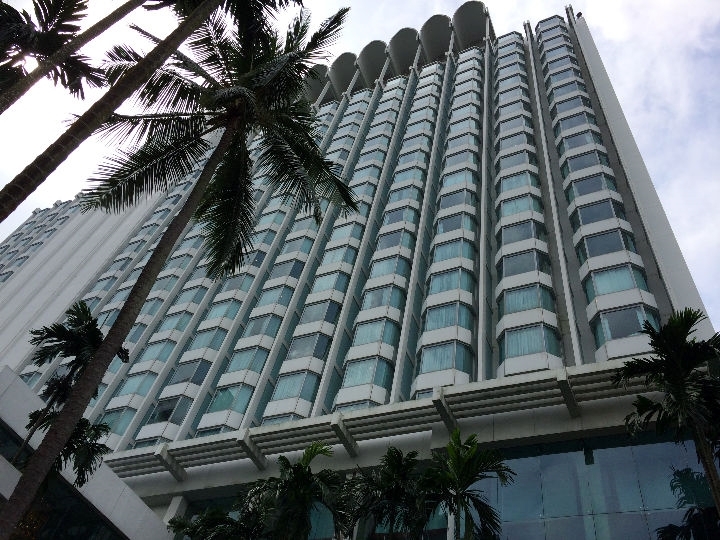 < < < < < < The Shangri-La Hotel. 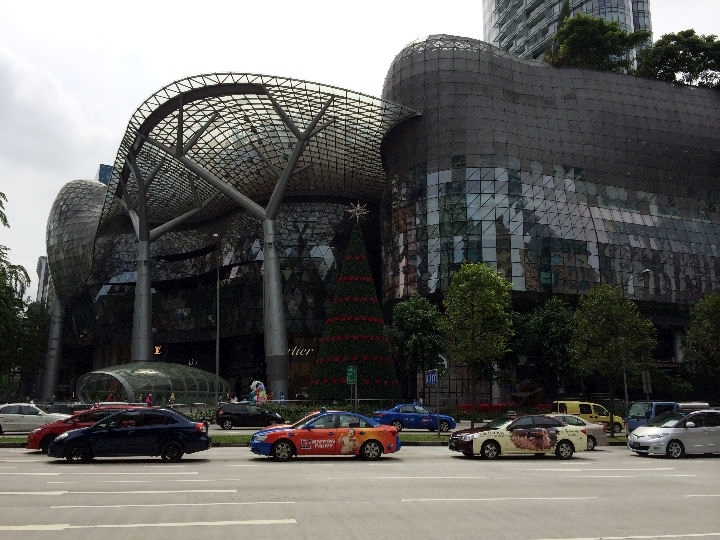 < Here we are at Orchard Rd. 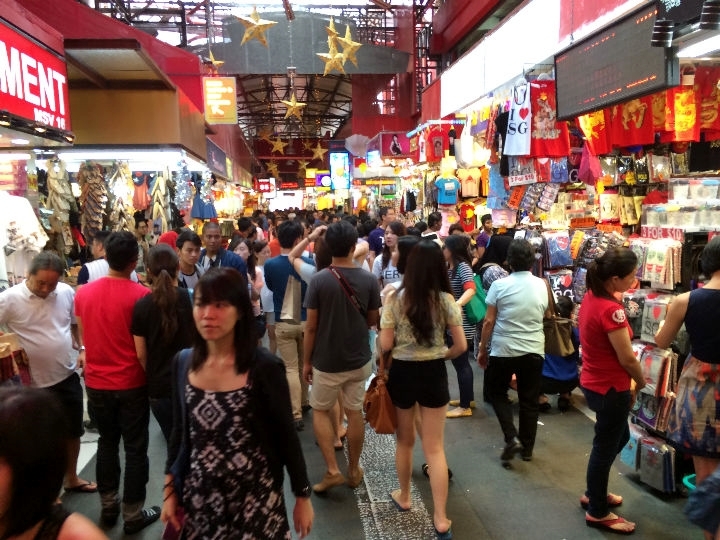 < < < Orchard Rd shopping area. 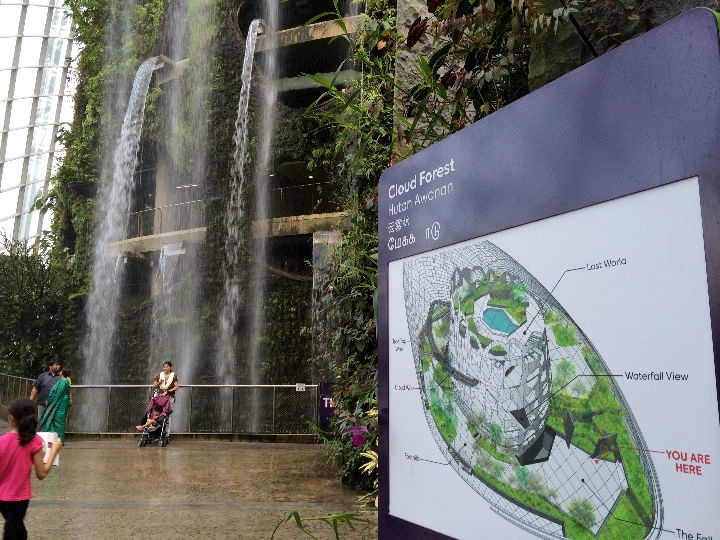 < Ready to start at Gardens by the Bay. 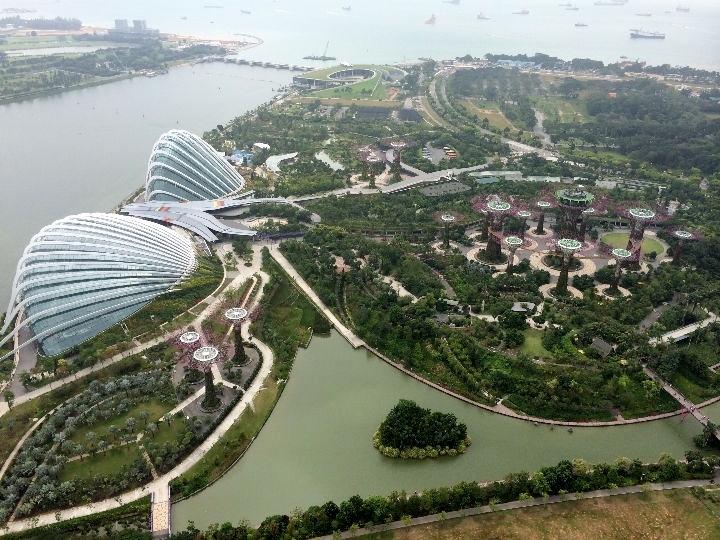 < < < < View of Gardens by the Bay and area around. 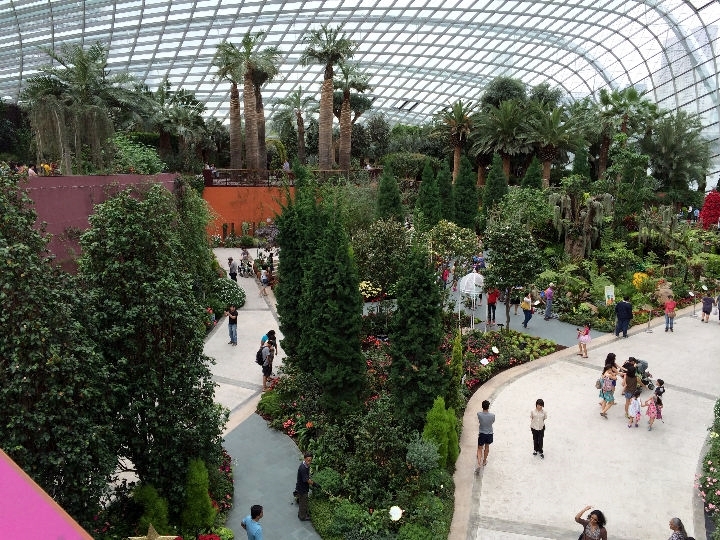 < < Inside the Flower Dome. < < Inside the Cloud Dome. 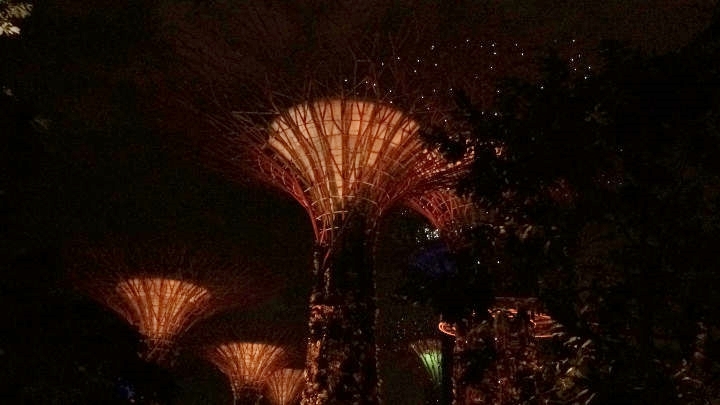 < < Supertree light show. 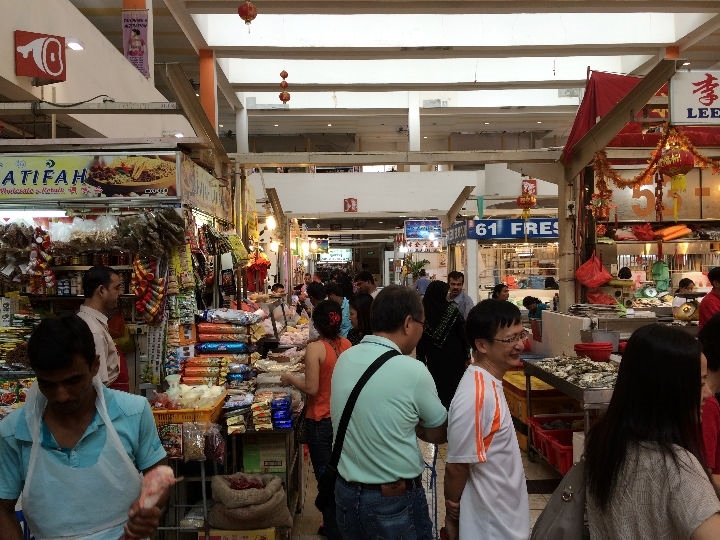 [Saturday] December 28th - After breakfast, we met another of Lawson's Singapore ex-TI friends, Michael, at 10 AM for a trip to Little India, Chinatown and Bugis Street. 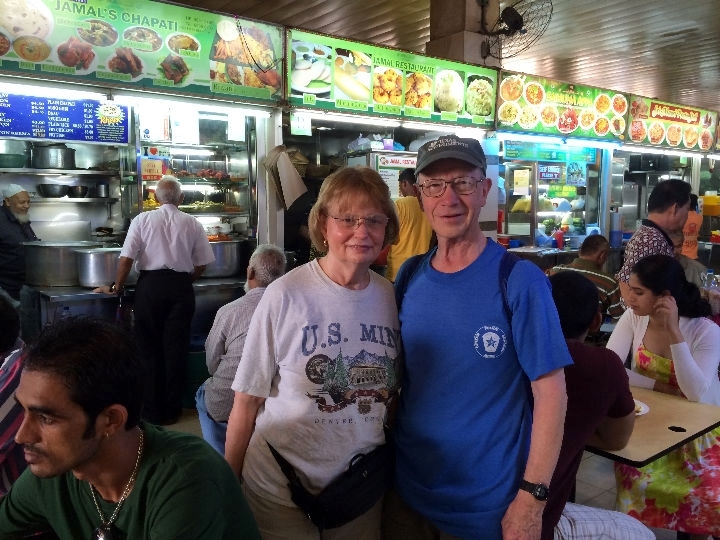 While in Little India, Michael contacted another ex-TI'er, Cheng Poh, who, along with his wife, met us. 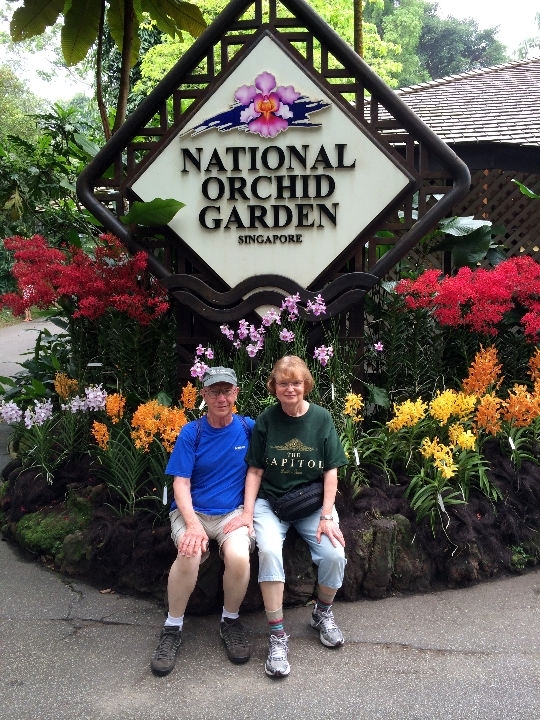 We all made the rounds and bought some Singapore T-shirts and Kay bought a Singapore Christmas ornament. Michael treated us to lunch in Chinatown and after a full day of siteseeing, Michael dropped us off at our hotel. 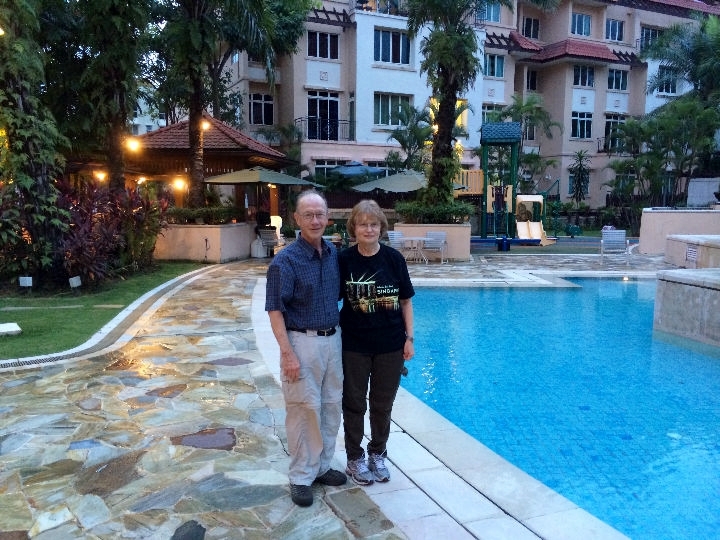 At 6 PM that evening, Bing Hwee picked us up at the hotel and took us to his and Olivia's flat for a nice dinner. They live in a very nice group of what we would call townhomes in the US. 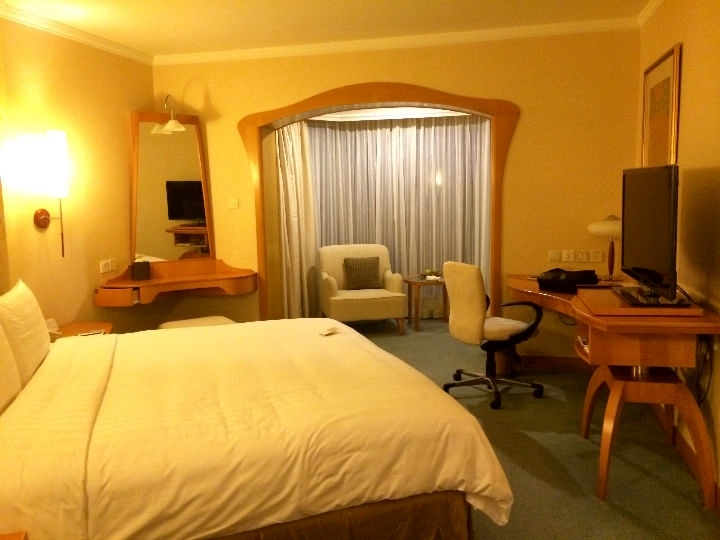 They dropped us off at our hotel around 10 PM, after the jet lag started to make us very quiet in conversations. 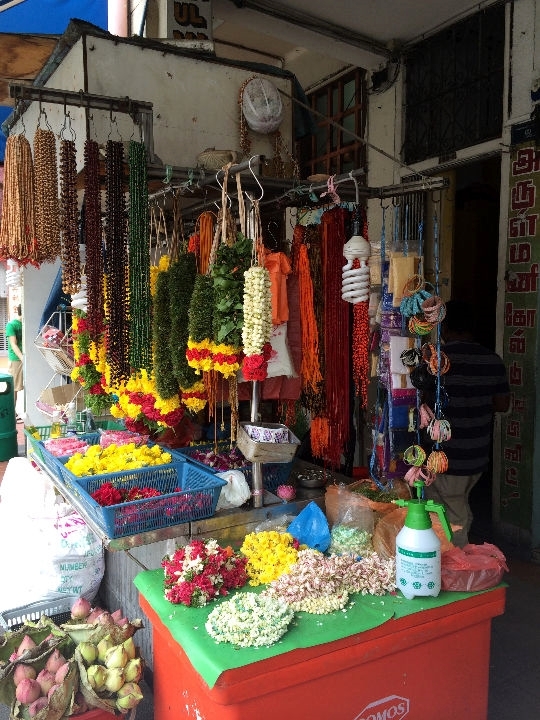 < < < < < < Little India. 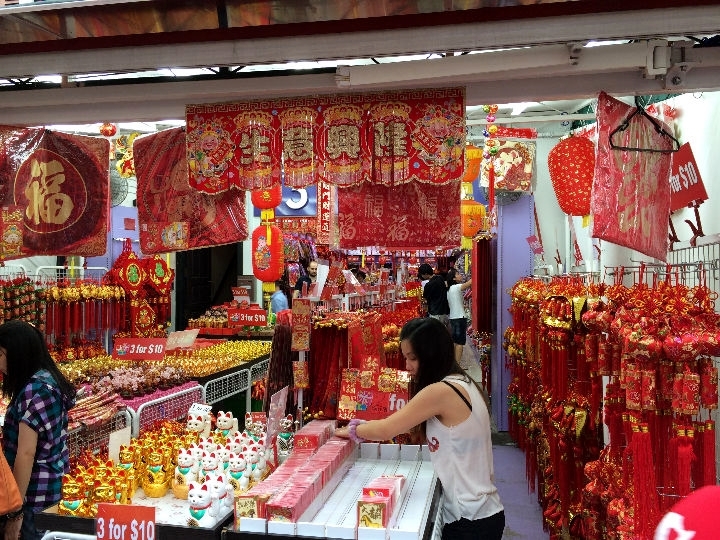 < < < < < < Chinatown. 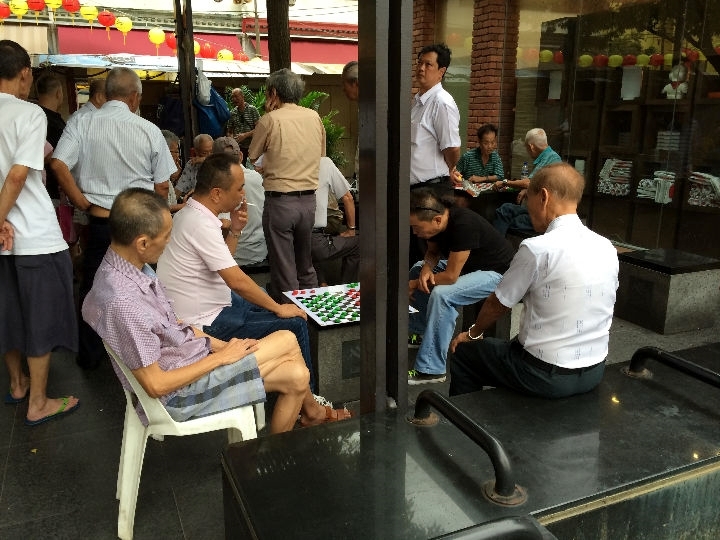 < Outside Bing Hwee & Olivia's flat. 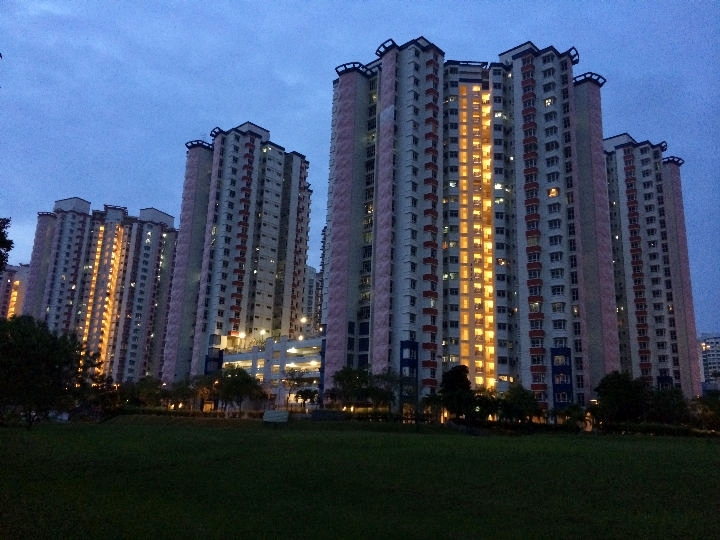 < Some of the large housing buildings that most Singaporeans live in. 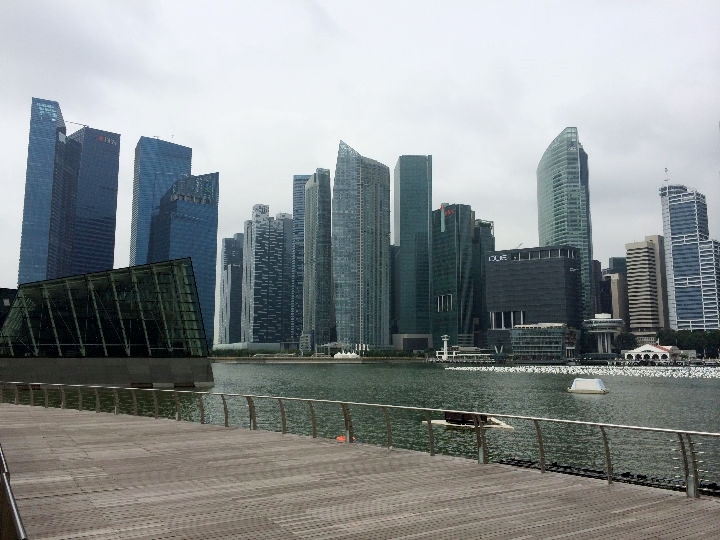 [Sunday] After breakfast on Orchard Rd., we took the MRT to Marina Bay and then went over to the Marina Bay Sands Hotel/Casino. 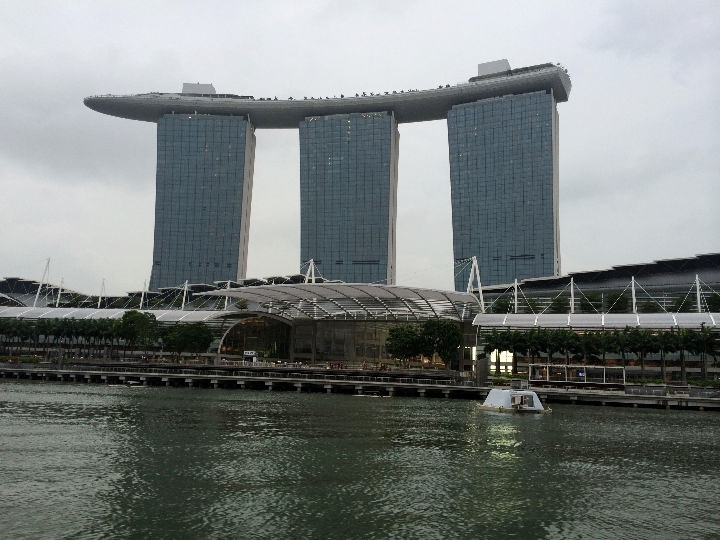 This is the most impressive structure that combines three hotel buildings with a replica of an oceanliner on top. 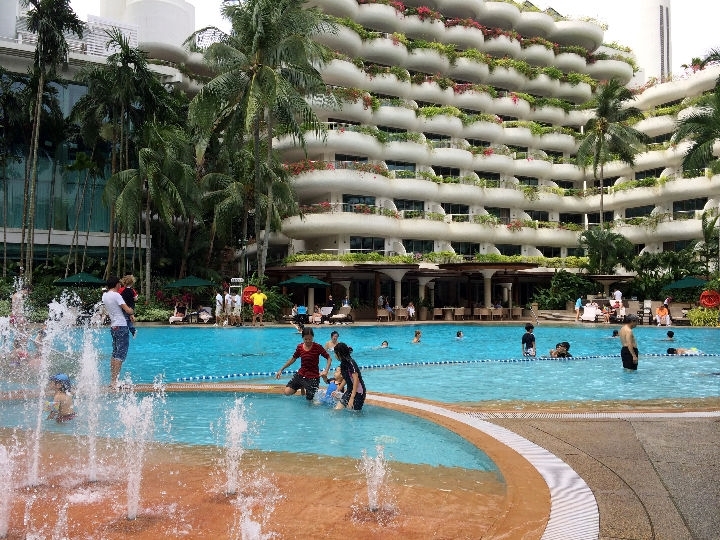 Up on top is a large swimming pool for hotel guests and a park with lots of trees. 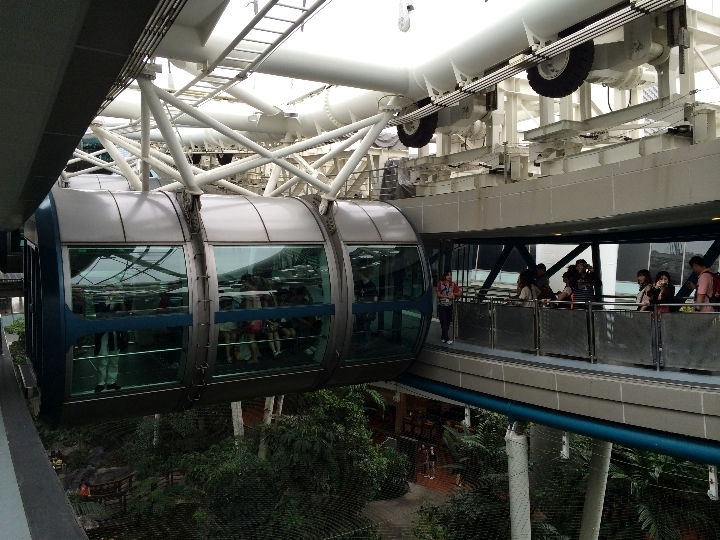 There is a Sky Park observation area that we could go to and get a panoramic view of downtown Singapore, the Singapore River and all the area sights. 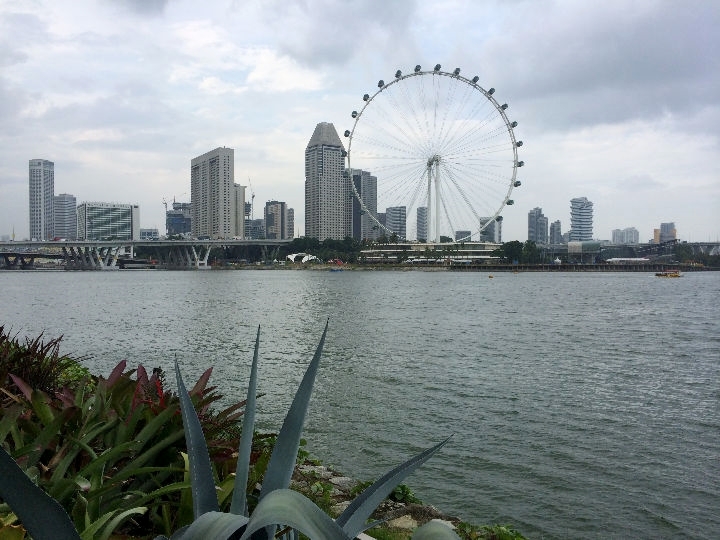 Afterwards we walked across the Helix Bridge (designed to match DNA structure) and looked across the way to the Singapore Flyer. 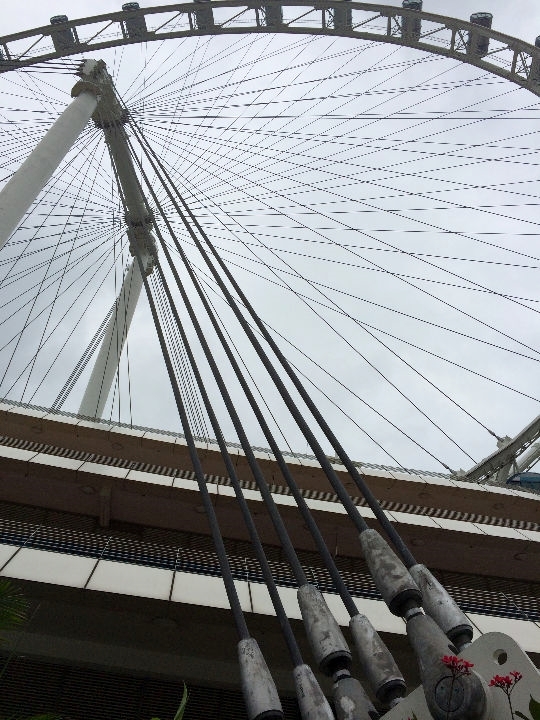 The Flyer has an overall height of 541 ft and is currently the world's tallest operational Ferris wheel. 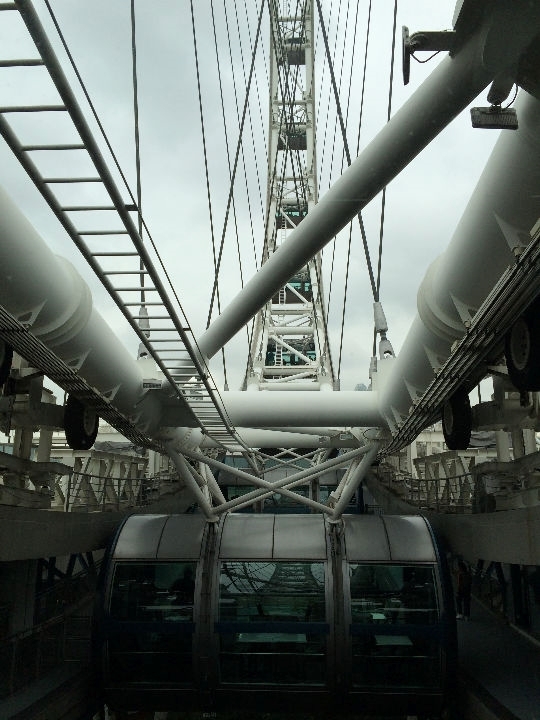 It has 28 air-conditioned capsules that are each able to accommodate 28 passengers. We planned to ride it in a few days. 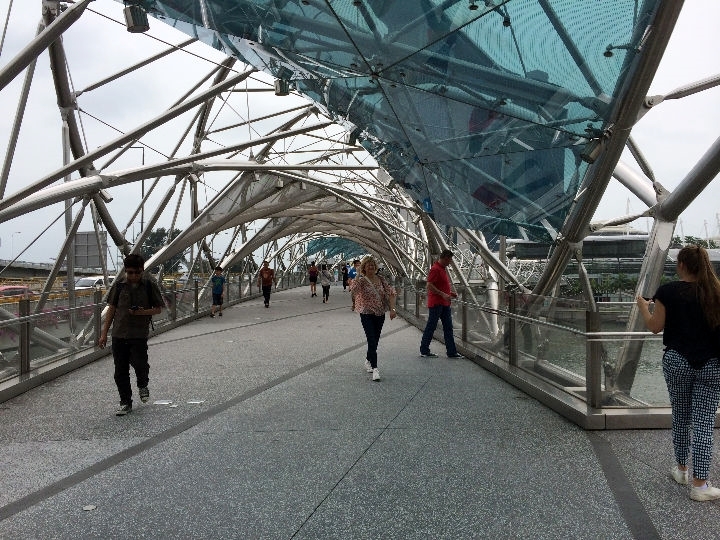 We walked back across the Helix bridge to the Sands hotel and then took the MRT back to Orchard Rd. 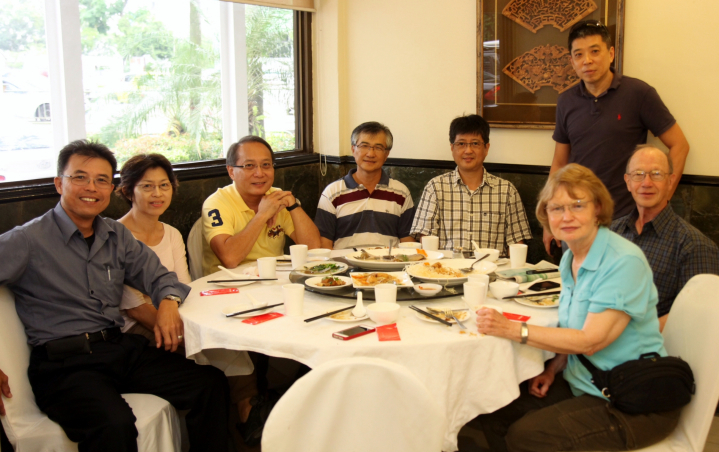 That evening, two more of Lawson's ex-TI Singapore friends, Boon Quey and husband Joo Kwang, picked us up at the hotel and took us to Chinatown to a nice restaurant where we met another of Lawson's ex-TI friends, Poh Khai, and enjoyed a very nice Chinese dinner. They returned us to our hotel around 10 PM. 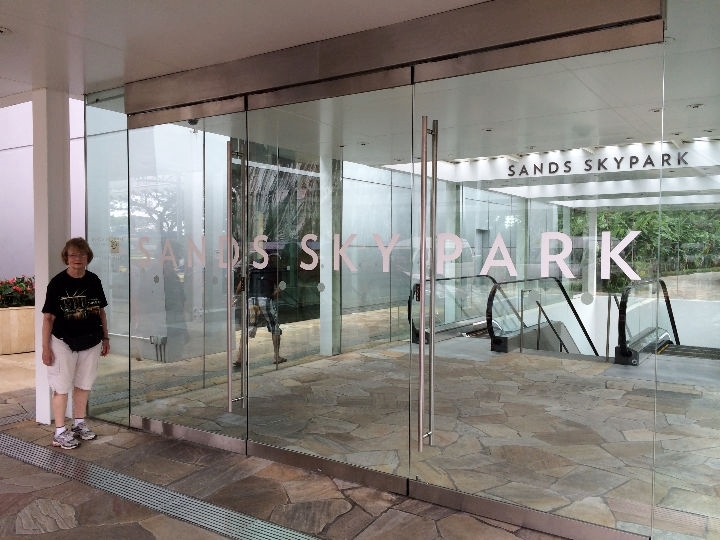 < Entrance to Sky Park elevators. < < View from the top. 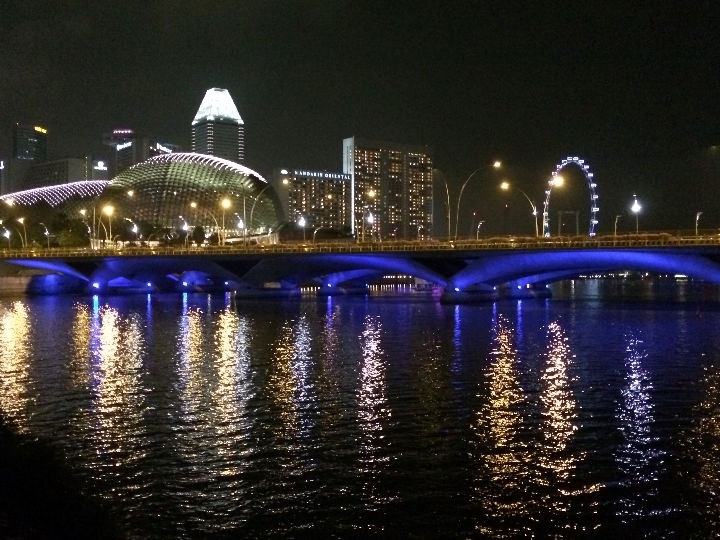 < < Helix Bridge with Marina Bay Sands Hotel in background. 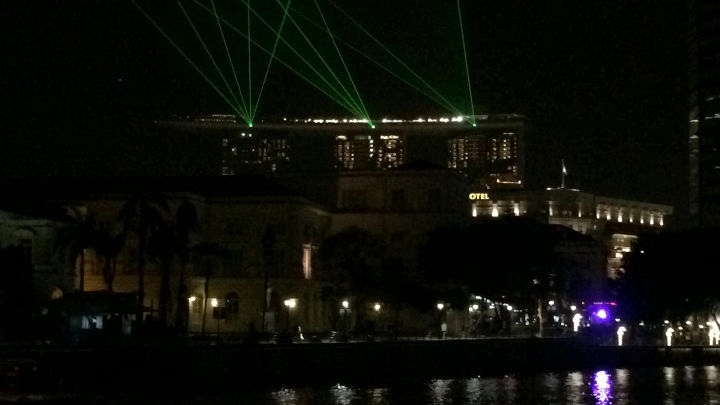 < View of business center from Sands hotel. 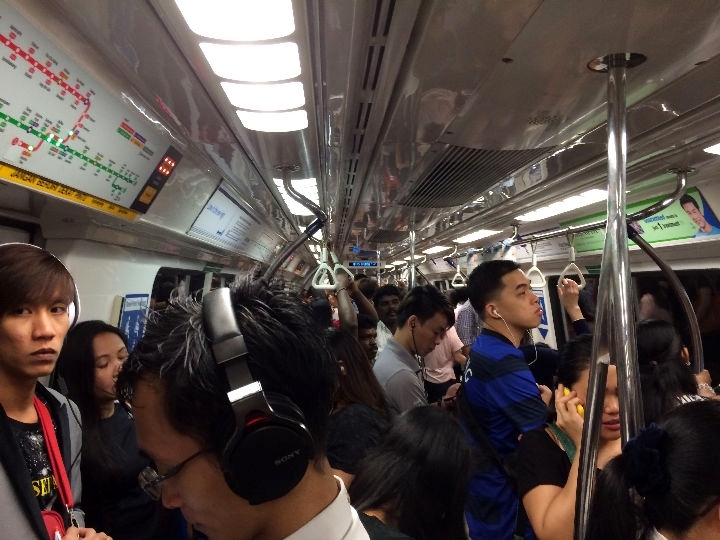 < On the MRT subway. 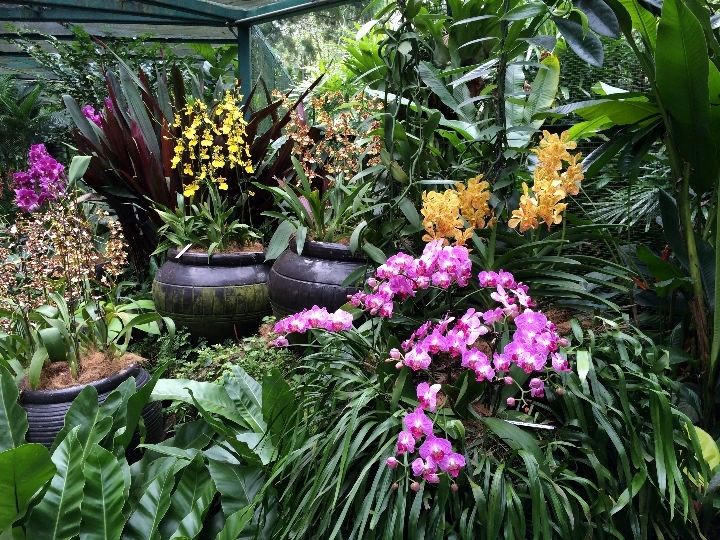 [Monday] After breakfast on Orchard Rd., we rode a taxi to the Singapore Botanical Gardens and toured it, along with the Orchid Garden. 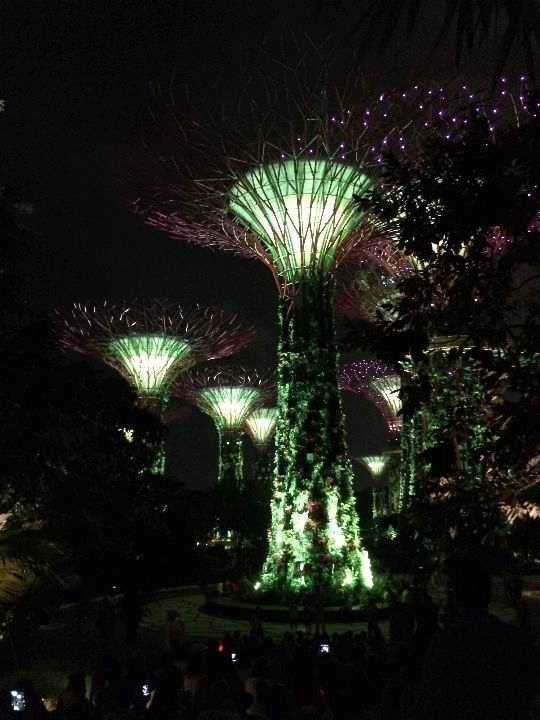 Since Singapore is on the equator and has tropical weather all year, the vegetation is outstanding. 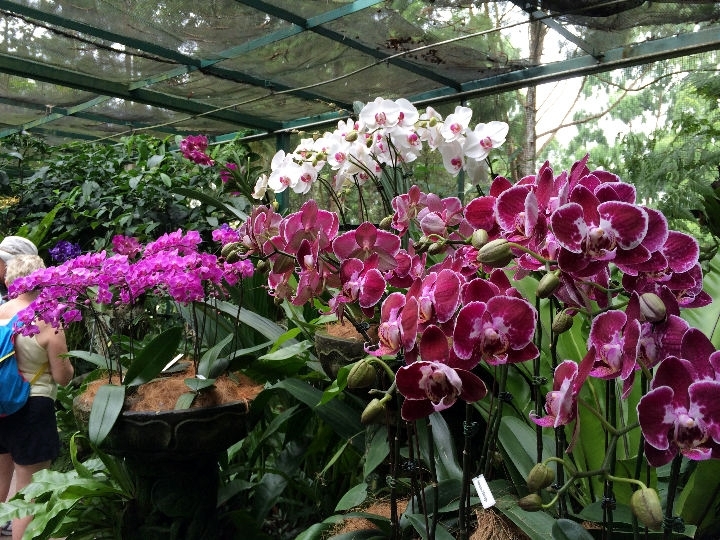 Flowers seem to bloom all year. 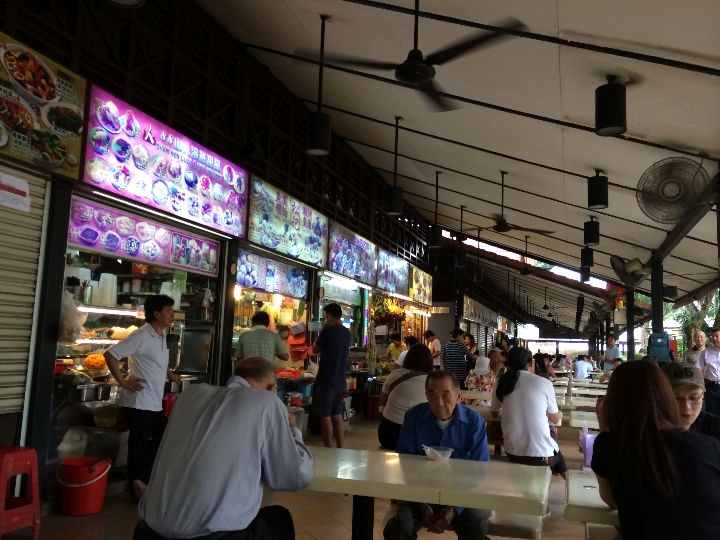 We spent the major part of the day there and ate lunch at one of the food courts (hawker style) that was on the garden grounds. 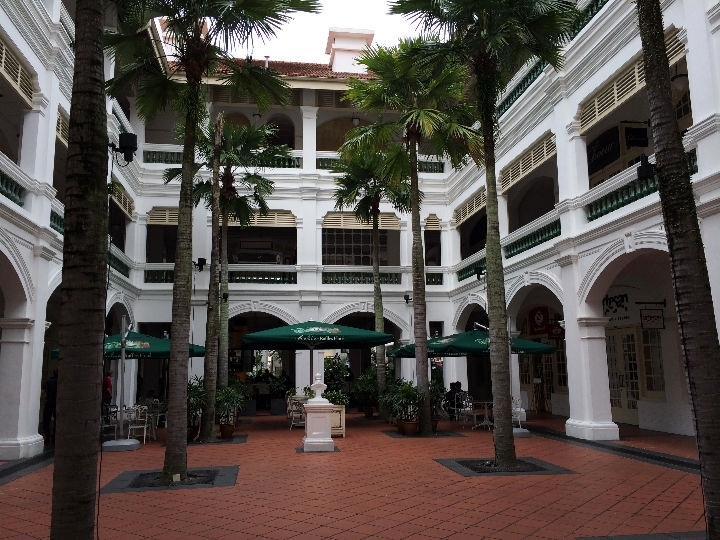 Afterwards, we walked to the nearby MRT station and rode to the station near the Raffles Hotel. 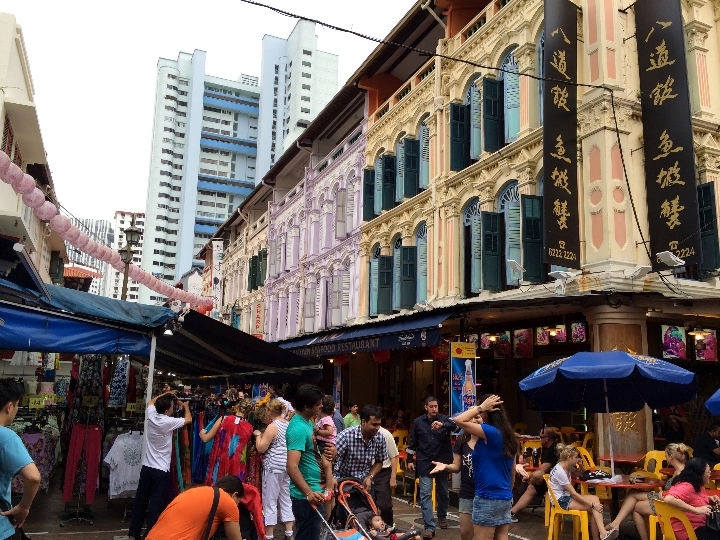 The Raffles is an old historic hotel, built during the time Singapore was a British Colony. 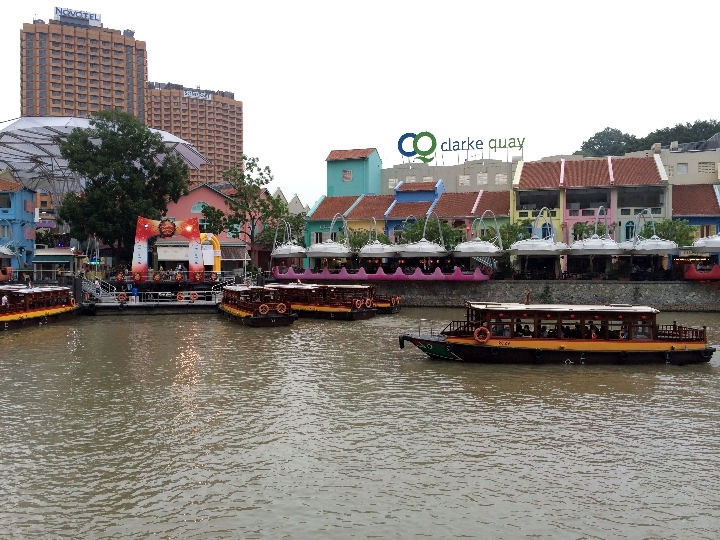 We looked around it and then took the MRT to Clark Quay to meet Olivia for a boat cruise on the Singapore River. 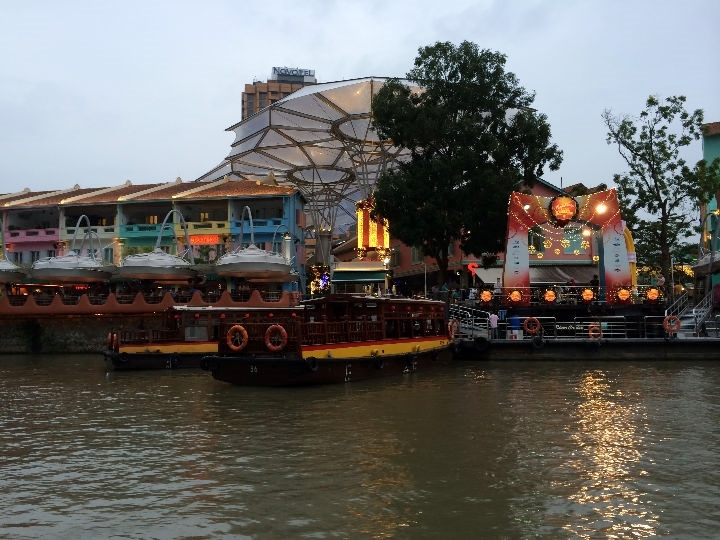 The Singapore river is damed up and is like a large lake with all the tourist sites around it. 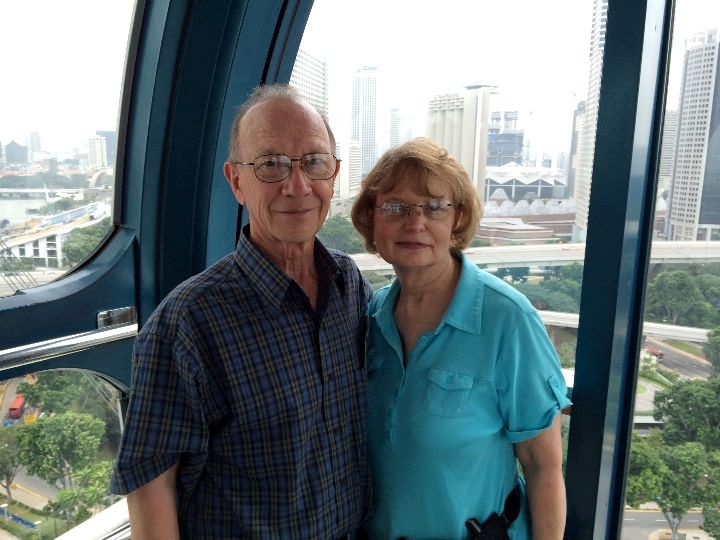 The cruise was very nice and we enjoyed it. 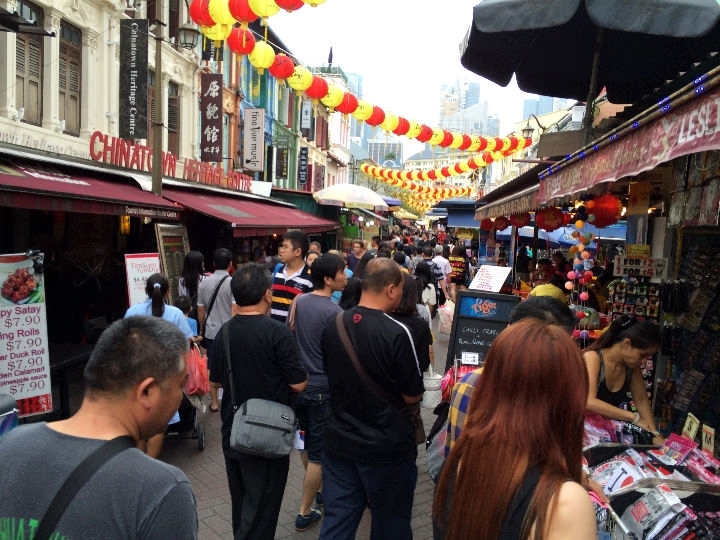 Afterwards, we accompanied Olivia to Chinatown and ate dinner at one of the hawker stands. We returned to the hotel at 9 PM. Another full day of walking - got our 10,000+ steps again! 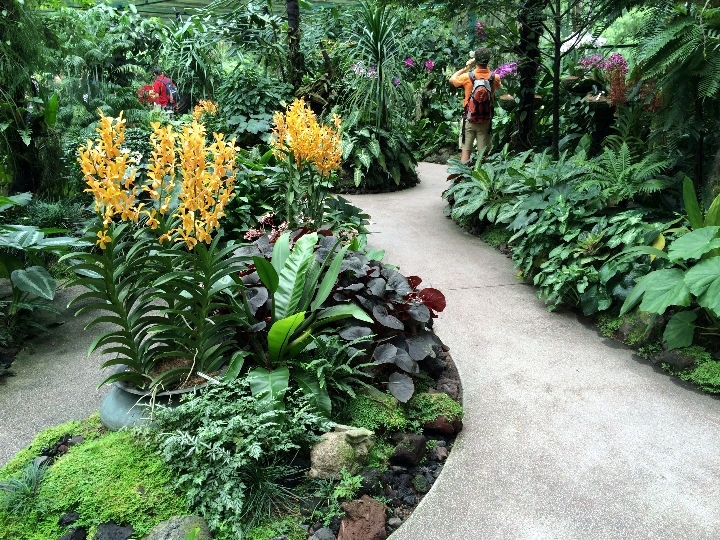 < < < < < < < < < Singapore Botanic Gardens & National Orchid Garden. 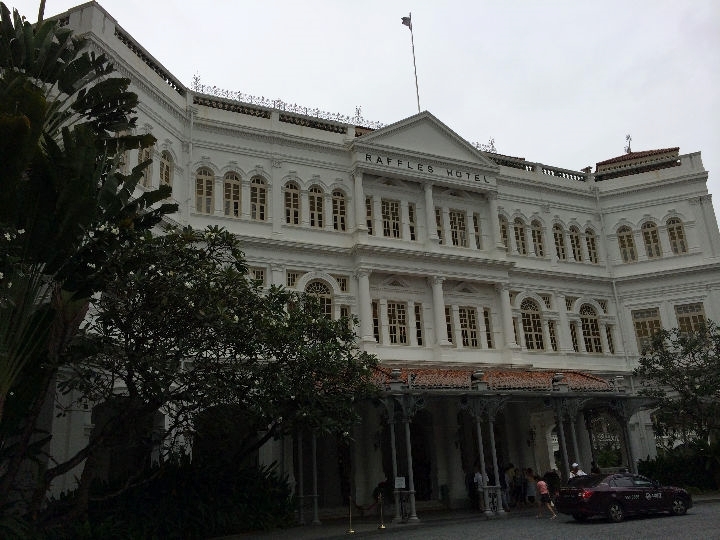 < < The historic Raffles Hotel. 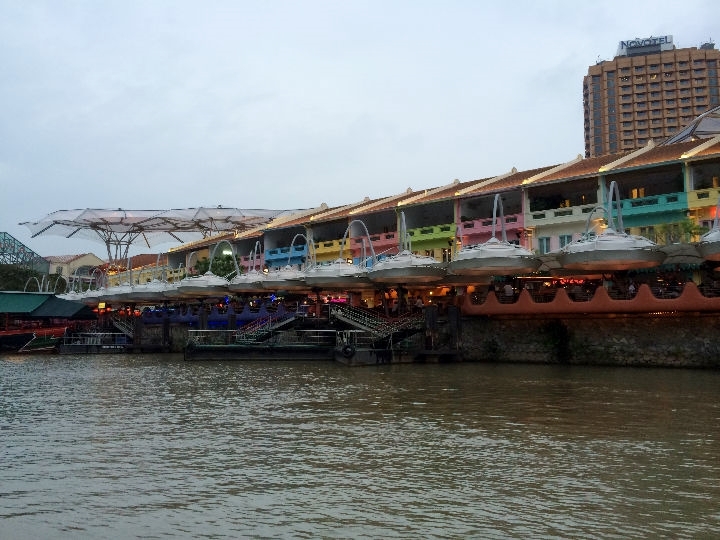 < < < < < < < Views from the boat ride on the Singapore River. 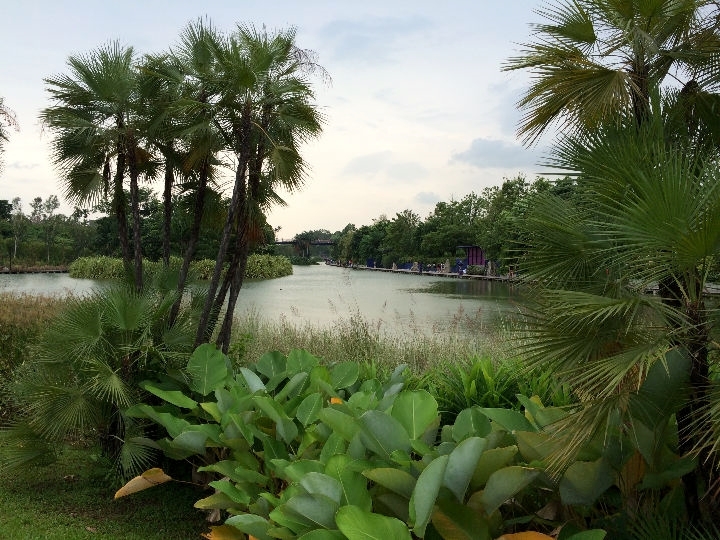 [Tuesday] New Year's Eve - Lawson's friend, Kwee Song, that still works in the TI-Singapore office, picked us up at the hotel at 11:15 AM to attend a lunch get-together that he arranged for us with many of Lawson's ex-TI friends there. 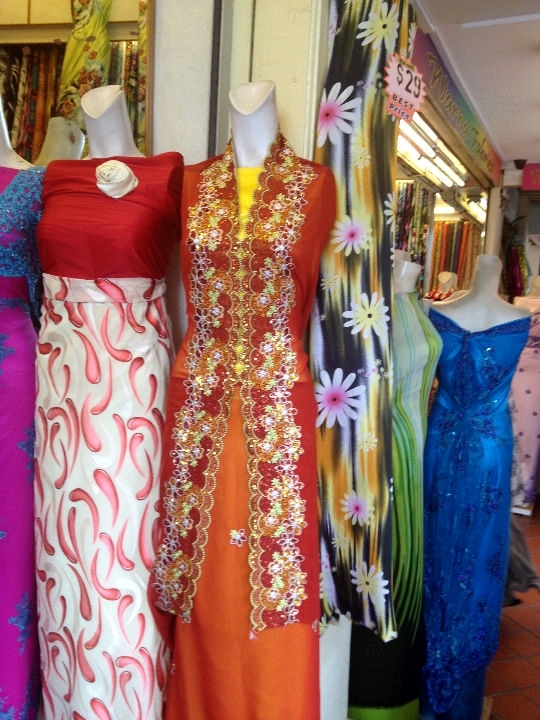 Attending were Kwee Song, Soon Huat, Weng Heng, Michael, Beng Hwee, Olivia and Kay & I. 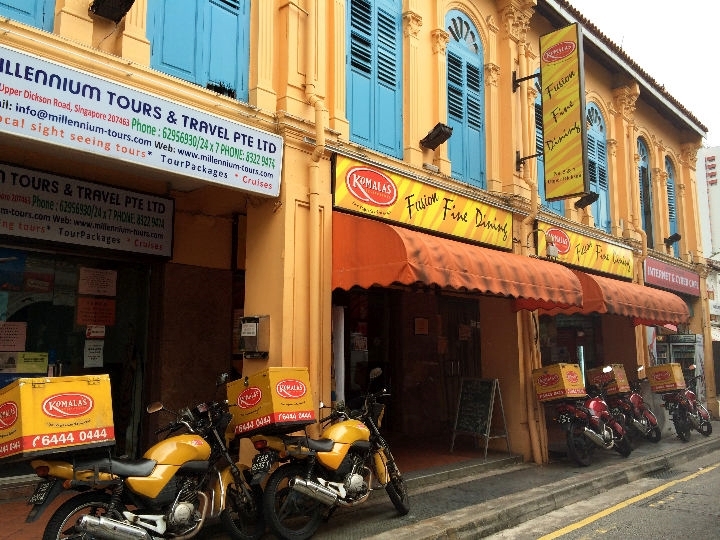 We had a very enjoyable lunch in the restaurant that is just across Bendemeer Rd. from the old TI factory. 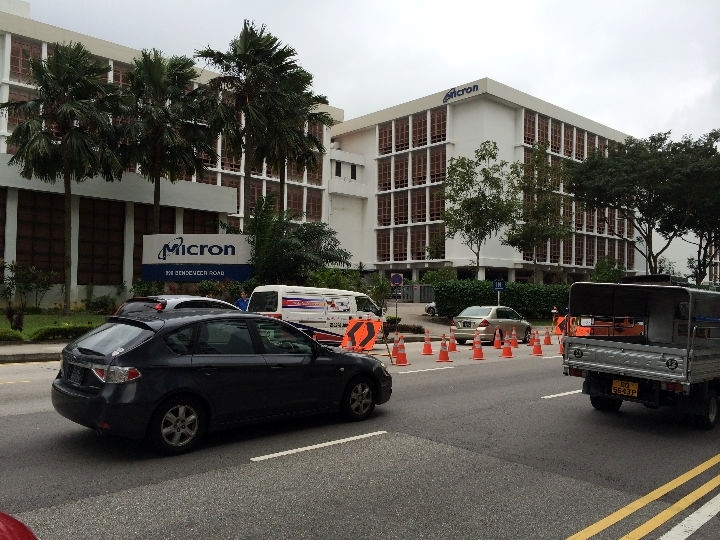 The Singapore factory was sold to Micron Semiconductor back in 1998, when Lawson retired from TI. Another friend, Phyllis, that still works for Micron, gave us a tour of the Micron factory. It is highly automated assembly and test for Flash Memory. Very interesting to see the changes that have been made. 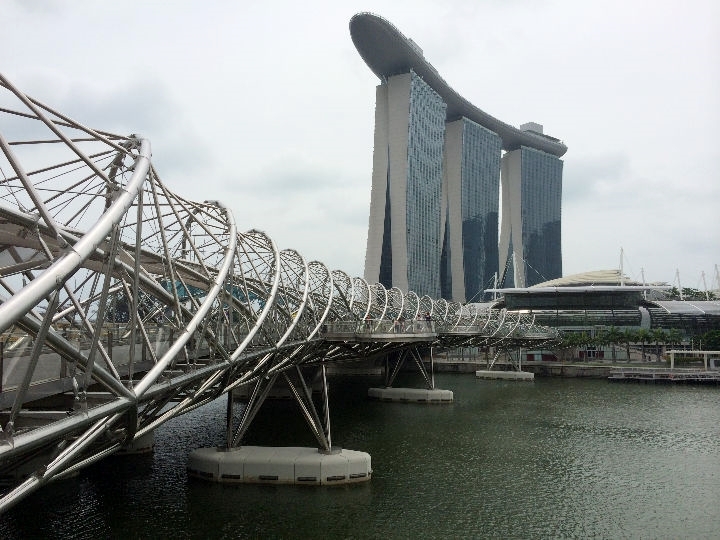 After our tour, we rode the MRT to Marina Bay and rode the Singapore Flyer. Afterwards, we went back to the hotel before the New Year activities started and watched some local TV before retiring before midnight. Another loooong day - but very enjoyable! 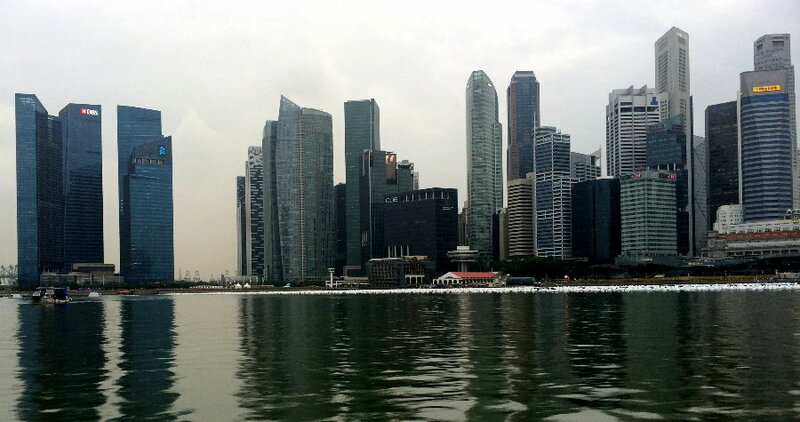 < < The TI-Singapore factory that is now Micron Semi. 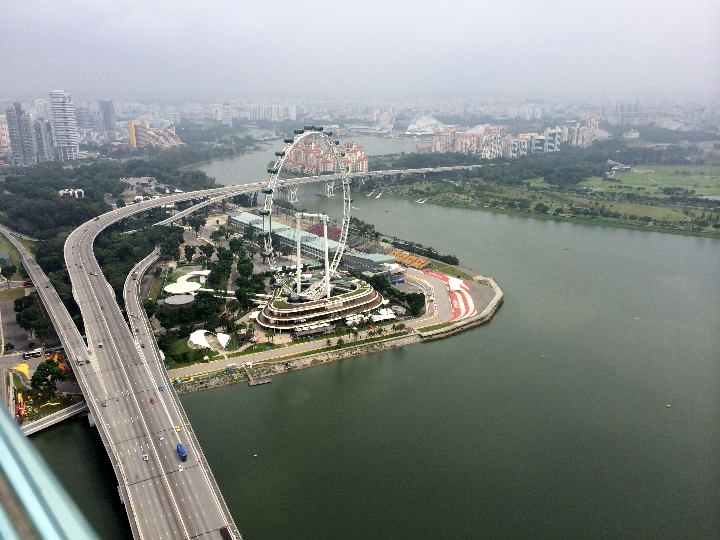 < < < < < < The Singapore Flyer. 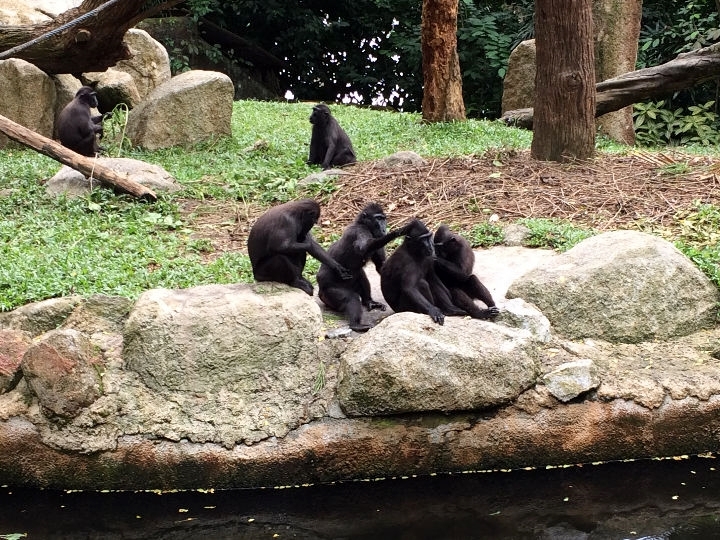 [Wednesday] New Year's Day - After breakfast on Orchard Rd, we caught a taxi to the Singapore Zoo. 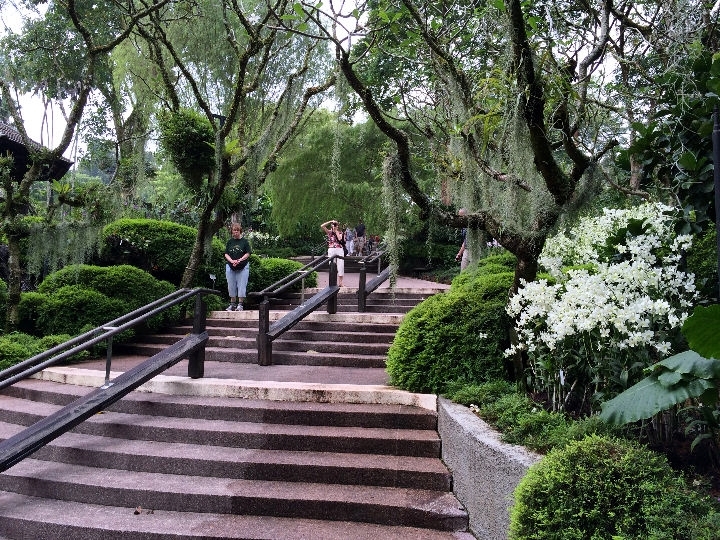 It was a terrible day to visit any popular spot with local appeal because almost everyone was on holiday today. 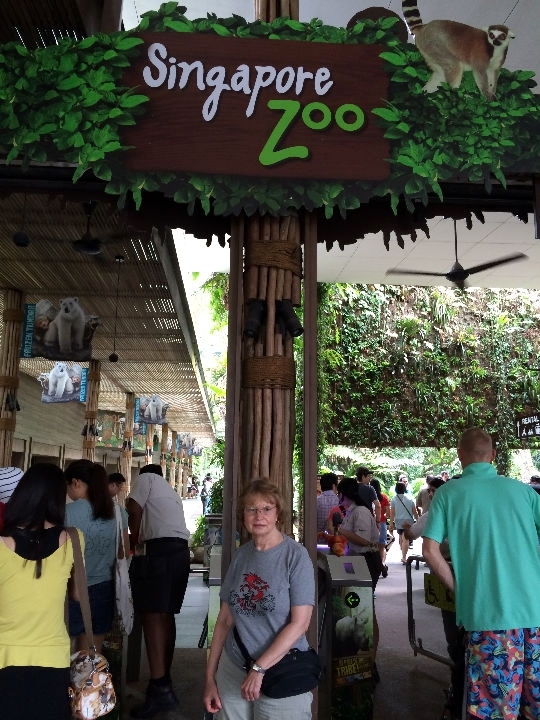 But, we were able to walk through the zoo and see all the animals that were out, so we didn't really miss out on much. 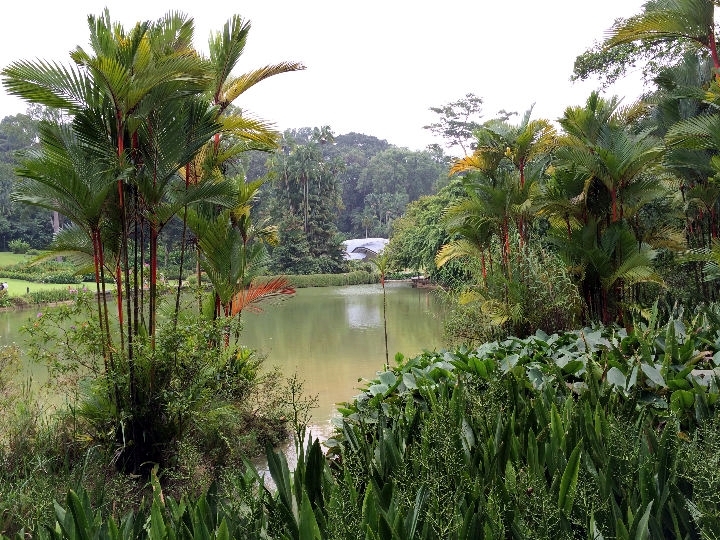 The Zoo has over 2,800 animals inhabiting a lush tropical rainforest. 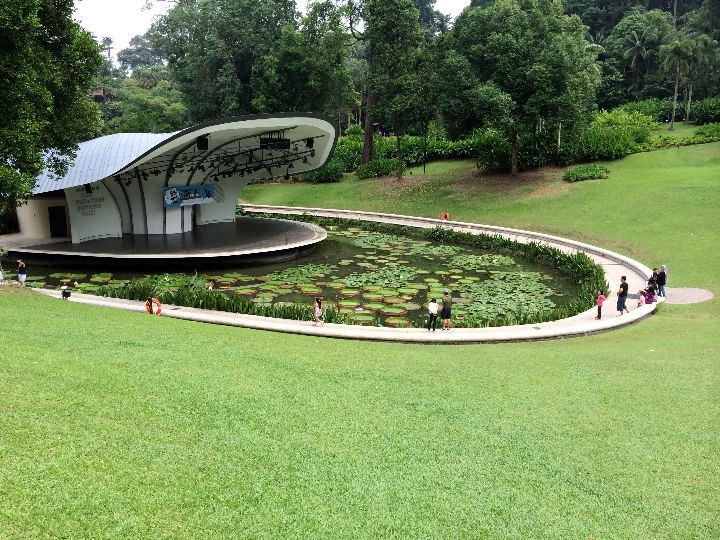 After we finished at the Zoo, we were informed of a free shuttle bus that would take us to the MRT station. 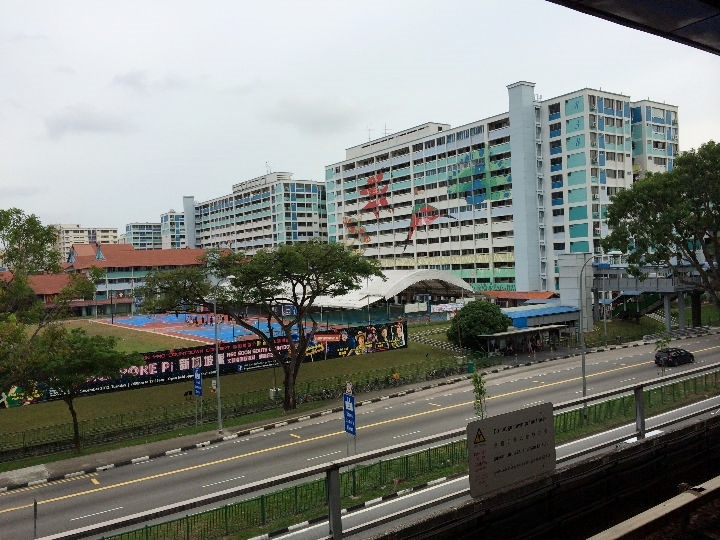 We rode the bus and then the MRT back to the Orchard station. 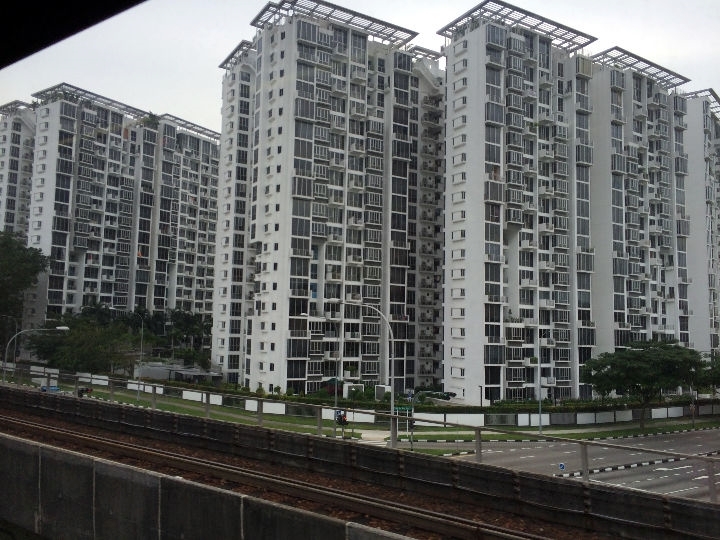 Along the way, we saw some of the local housing complexes. 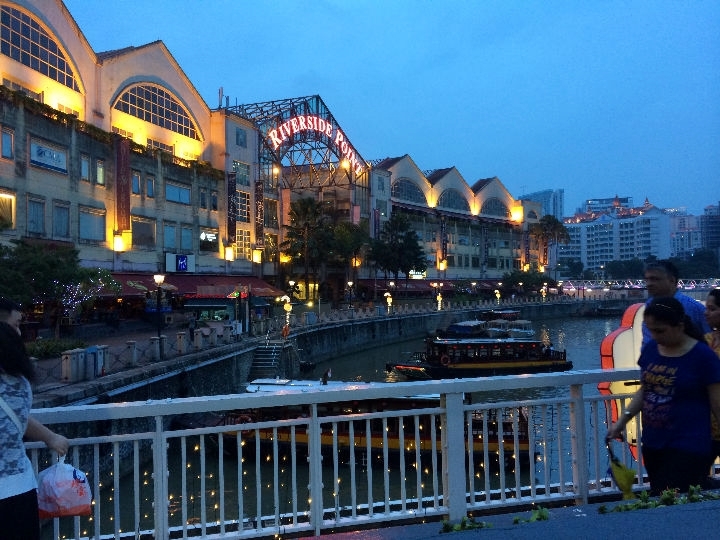 That evening, we met another of Lawson's ex-TI friends, Ric, for dinner at Clarke Quay, along the Singapore River. 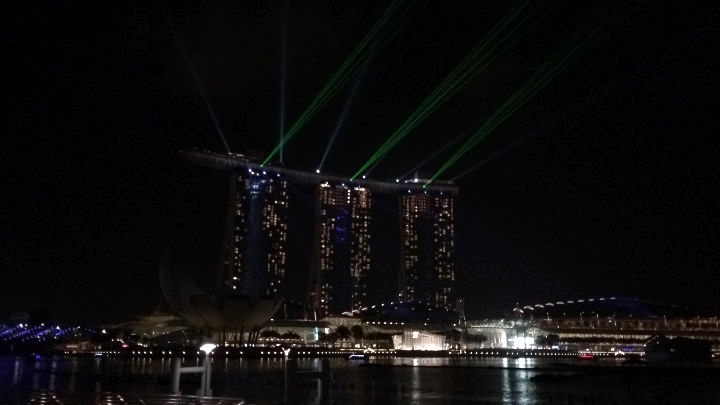 After a nice seafood dinner, we enjoyed a laser light show that is displayed from the top of the Marina Bay Sands Hotel. 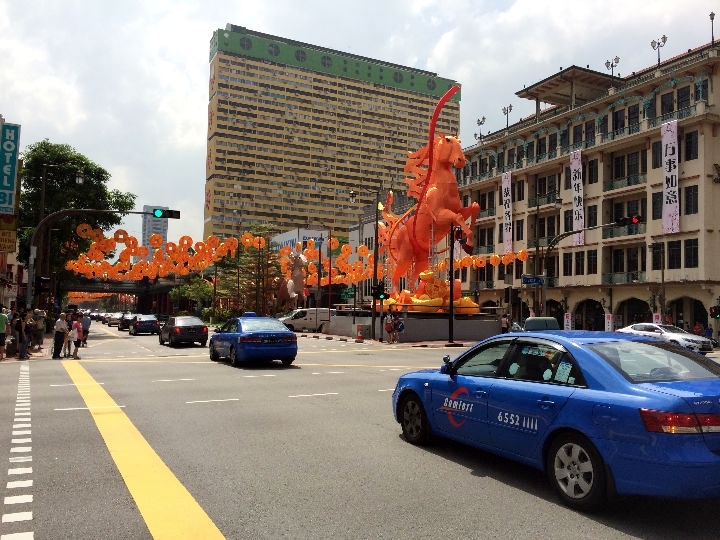 Afterward we took a taxi back to the hotel. < Riding in the taxi to the Zoo. 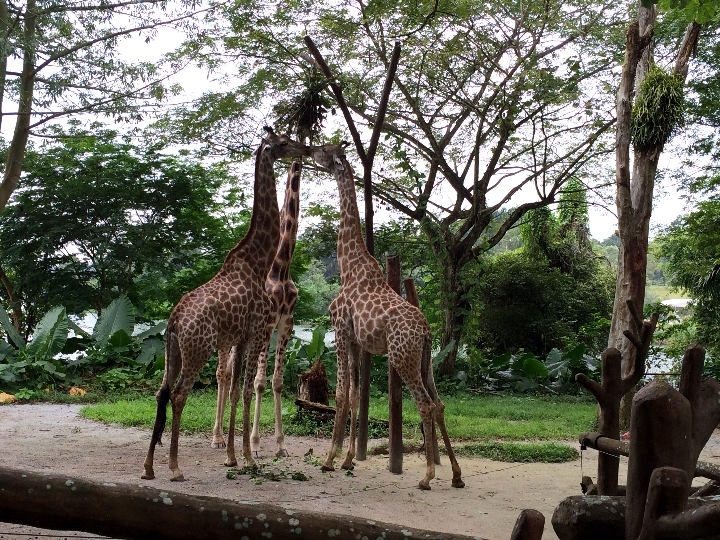 < < < Singapore Zoo. < < Large residential highrise. 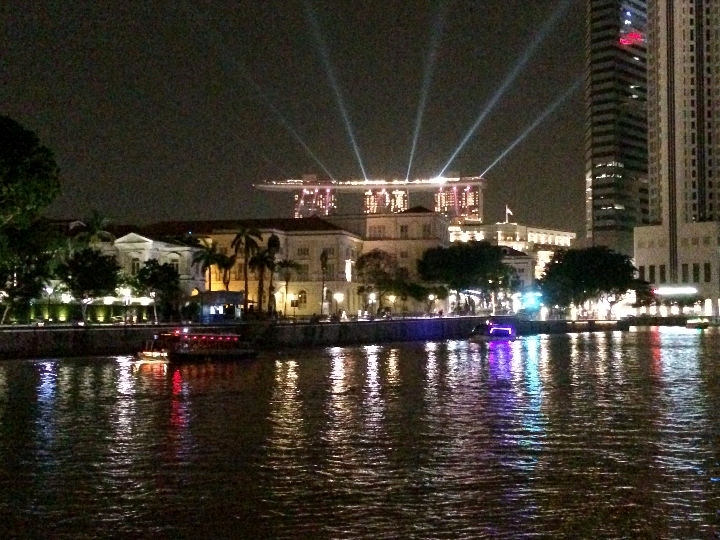 < < < < < < Views from Clarke Quay. 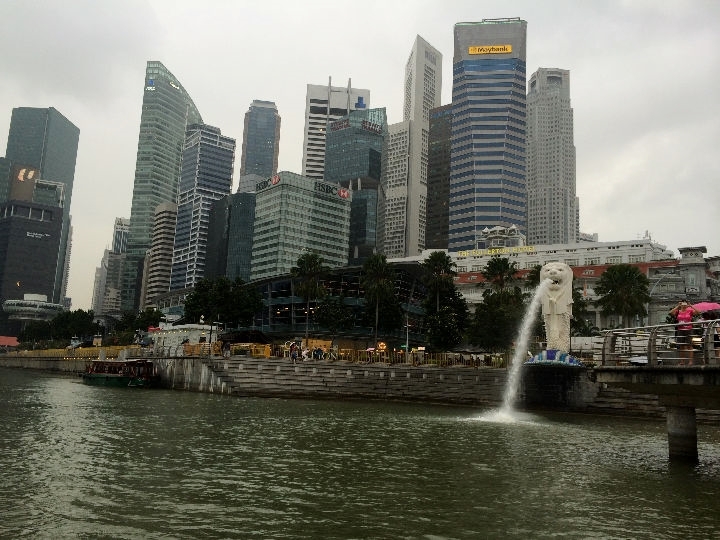 [Thursday] Today is our last full day in Singapore. 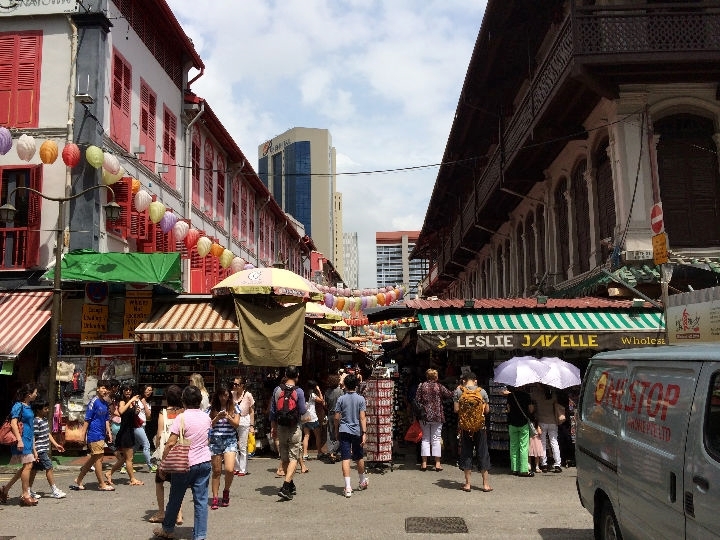 We took our final breakfast on Orchard Rd and took the short walk off Orchard to the Emerald Hill area. 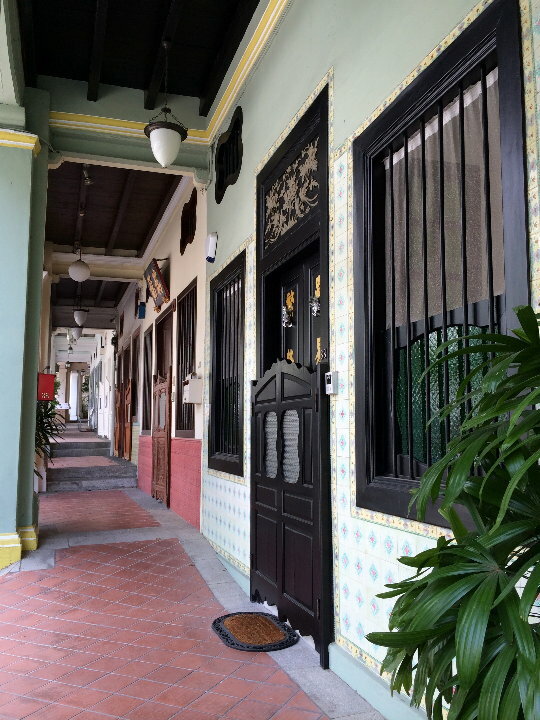 This is an old historic street, dating back to the mid-1800's. 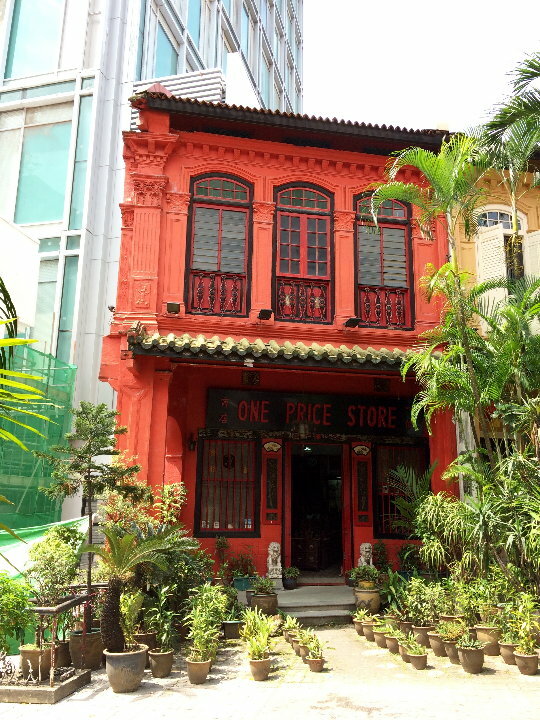 The area is known for it's terraced houses of "Chinese Baroque" architecture. 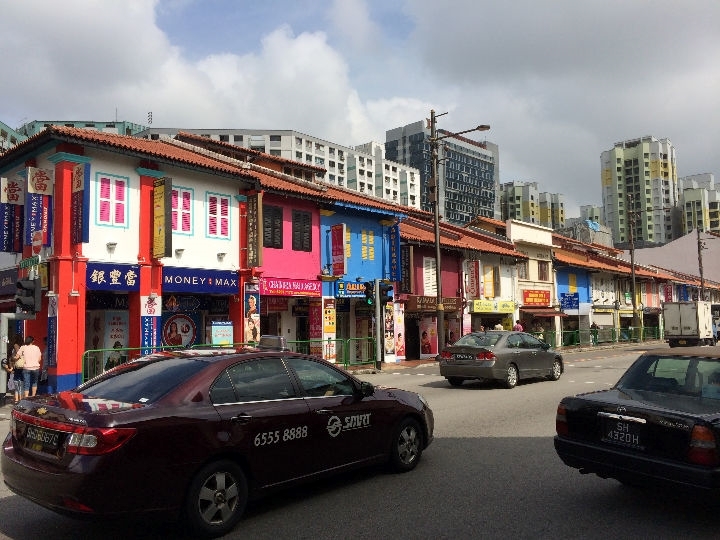 It is literally a few steps off the busy shopping district. 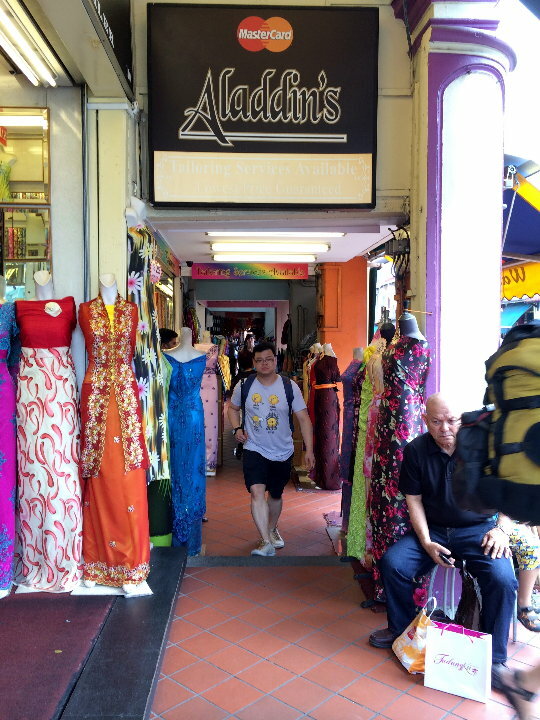 Afterwards, we rode the MRT back for a final run to Chinatown and Little India for last minute shopping. 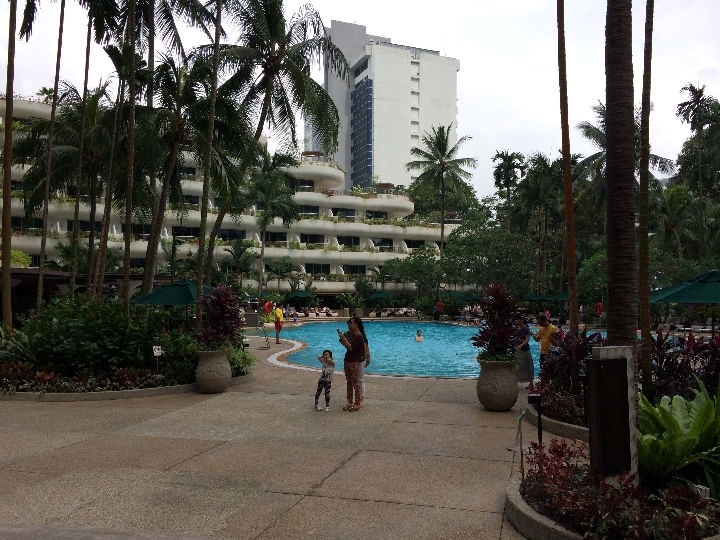 In the late afternoon, we returned to the hotel and packed for our return flight to Houston. 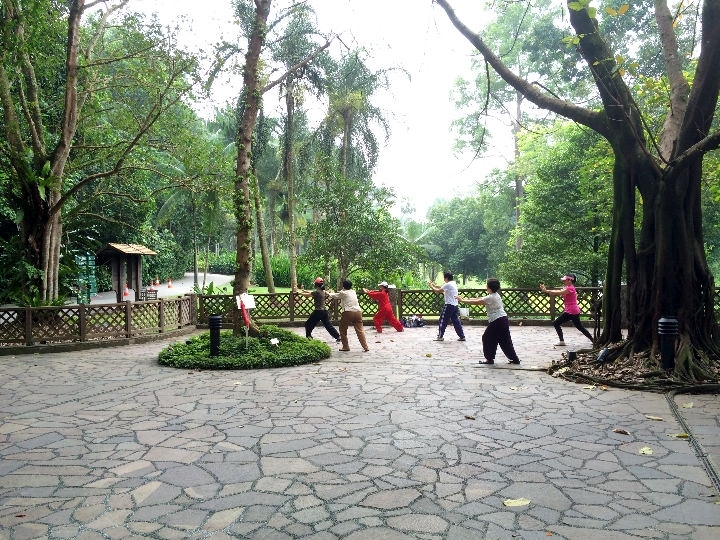 In the early evening, we took our showers, dressed for the airport and finished packing our bags. 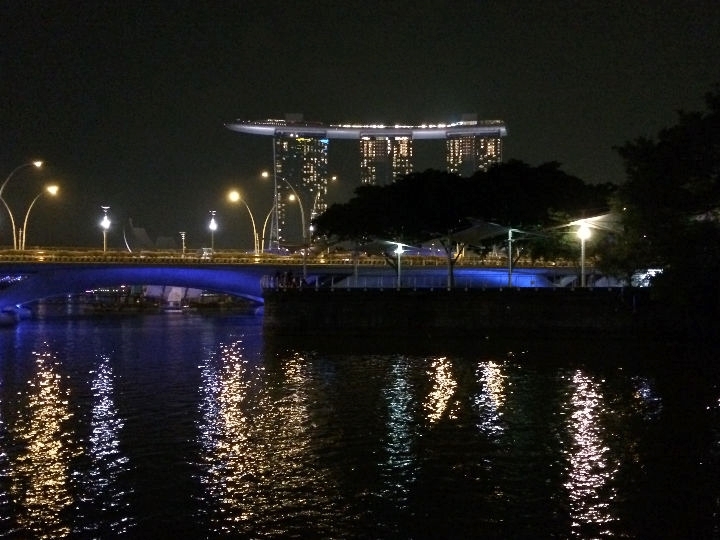 At 10 PM, we caught a taxi from the Shangri-La Hotel to Changi Airport to board Singapore Airlines flight SQ62 back to Houston. 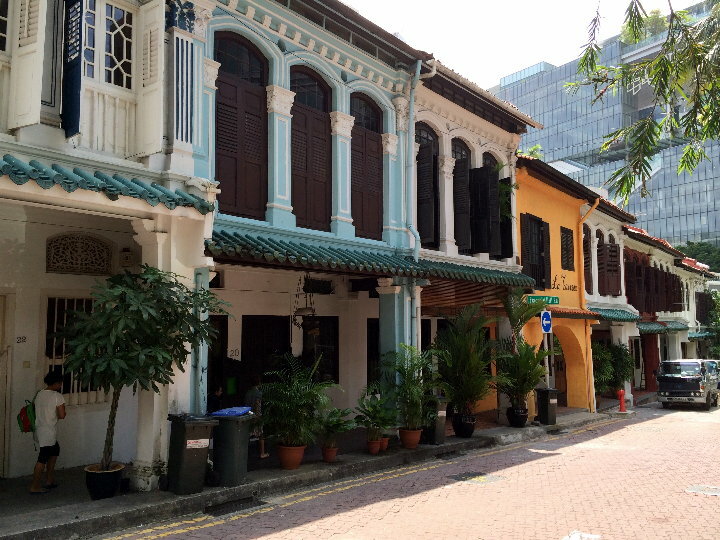 < < < Emerald Hill. [Friday] January 3rd, 2014, after going through the security check at Changi Airport, Terminal 3, Gate B13 was our departure lounge. Since our flight was scheduled to depart at 2:30 AM, we dozed some on the seats in the lounge. 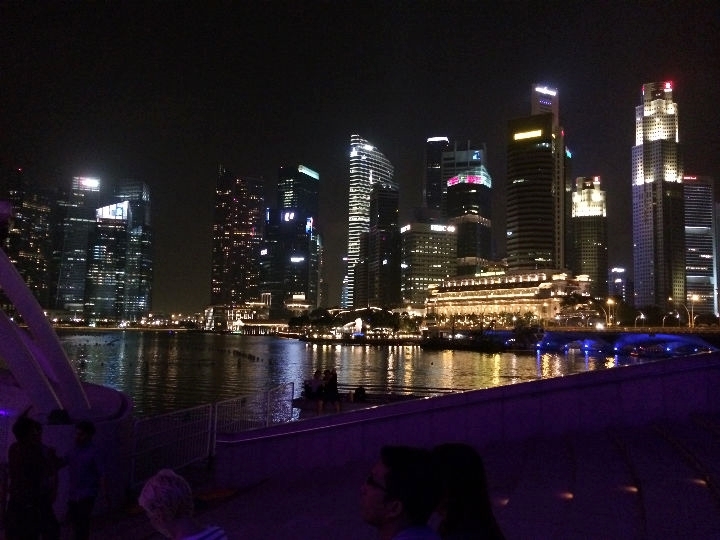 We spent our remaining Singapore money at a Duty Free shop there. Kay bought some jewelry. We boarded about 1:30 AM for the scheduled 11 hr and 15 minute flight to Moscow, arriving at 9:45 AM Moscow time to a temperature in the low 30's F and snow falling. At Moscow, we went through the security screening again, with a little more attention this time because of some bus and train bombings that took place in Volvograd, in southern Russia, the week before. After a short wait in the very small area for transit passengers, we boarded the airplane. Even though it was 10 AM there, it was almost dark because of the Winter season, Moscow's high latitude, and the heavy clouds and snow. They de-iced our airplane after pushing us back from the gate and we departed a few minutes late. Our 12 hour and 50 minute flight to Houston IAH was uneventful and we arrived in Houston at about 1 PM local time, ahead of schedule. It took about 1 hour and 15 minutes to get our bag and clear Customs. 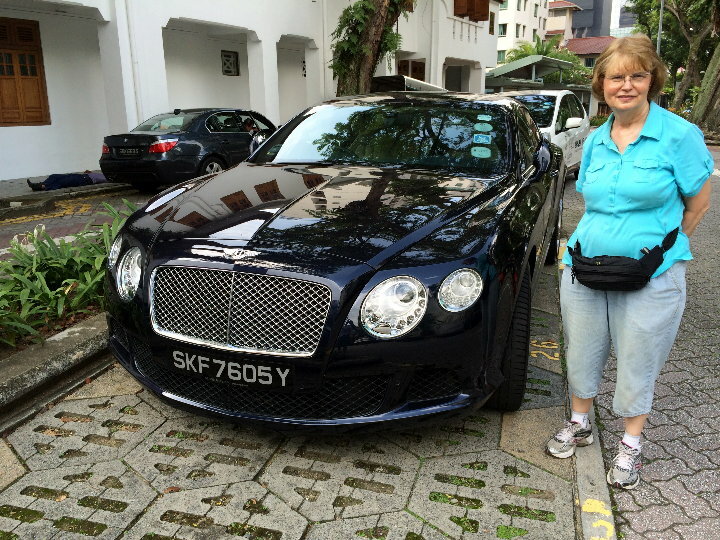 We took the shuttle back to PreFlight parking and picked up our car and drove back home, arriving around 4 PM. < Waiting for our luggage to arrive. 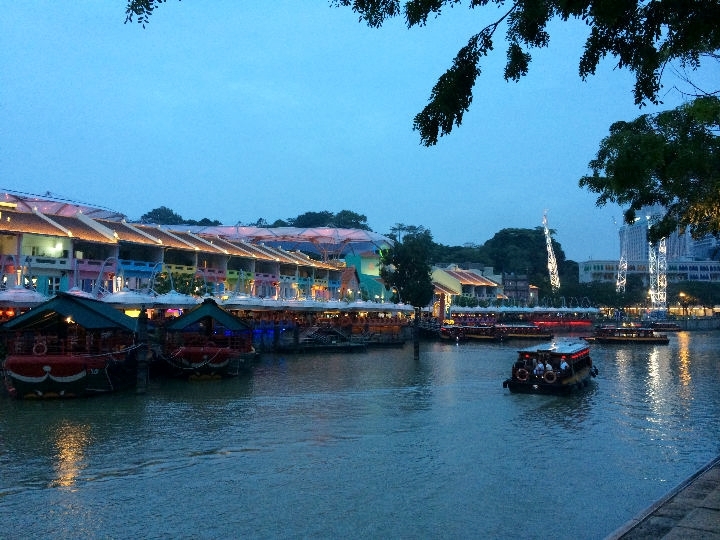 This draws to a close our vacation to Singapore. We hope you enjoyed the photos and brief descriptions of our activities. God willing, join us again soon for another travel adventure.